The equations of motion of the runner: is there a trade-off between mechanical efficiency and risk of injury when running? The title of my blog reflects my initial goal: promoting discussion of issues related to running efficiency. Perhaps the beginning of a new year is a good time to take stock of my current understanding of the topic. An additional reason for a review at this time is the recent protracted debate between Robert and myself waged in the comment section of my page on the Dance with the Devil (see side panel). This debate was fairly adversarial in character at times, and it prompted me to re-examine some of the issues related to the perennially thorny topic of gravitational torque. Robert’s challenges led me to do some computations, which as a by-product revealed some findings regarding linear velocity during the gait cycle. Because linear velocity is related to progress towards the finishing line, I think linear velocity is a more important aspect of running mechanics than the rotational motion arising from gravitational torque, which is largely about going around in circles (or preventing such motion). So I am grateful to Robert for re-focussing my attention on running mechanics and running style. Though first, it is important to put the issue of running style in a larger context. Granted that races at distance ranging from 5000m to marathon are run at a paces either a little above or a little below the anaerobic threshold, the greatest determinant of efficiency is the ability to achieve a high pace at threshold so as to minimise the amount of fuel-inefficient anaerobic metabolism. If the goal is efficiency, much of one’s training efforts should be directed at this raising the threshold pace. Whether this goal is best achieved by emphasis on high volume or high intensity training (or both) remains a controversial topic, but that is not the question I will focus on in this post. Instead, I will return to the less important but nonetheless intriguing question of running style. Almost certainly, the most important issue in considering the effects of running style on efficiency is minimization of risk of injury. Injury impairs not only performance at the time of injury but also leads to missed training and loss of aerobic fitness. Unfortunately, the evidence suggests there might be a trade-off between mechanical efficiency and safety. I think this can be illustrated most readily by examining solving the equations of motion of the running body (though if you are willing to accept my calculations, you do not need to do the maths yourself – I will illustrate the results pictorially). The complete solutions of the equations describing a multiply-jointed body made of viscoelastic tissues (i.e. tissues in which change of shape depends on how rapidly the force is applied) is of course horrendously complex. Nonetheless a great deal can be learned by focussing on the equations that describe the motion of the centre of gravity of the body (COG). If we know the time course of the external forces acting on the body – namely gravity; ground reaction force (GRF); and wind resistance – it is possible to perform an accurate computation of the motion of the COG. On the surface of the earth, the force of gravity is constant. It is the product of mass multiplied by the acceleration due to gravity (g), which has the value 9.8 metres/second/second (or 32 feet/sec/sec in Imperial units). Ground reaction force is the reaction of the ground to the push of the body against the ground. We can measure the push of the body against the ground quite precisely using a force plate, and therefore, since action and reaction are equal and opposite, we can deduce the GRF. Estimation of wind resistance is trickier, and for the purpose of this post, I will assume that wind resistance is negligible. I have presented the equations and a description of how I solved them, in the calculations page (see the sidebar). For simplicity I have assumed that the vertical component of ground reaction force (vGRF) varies sinusoidally while the runner is on stance, as shown in figure 1. This is a moderately good approximation to real data for a forefoot runner, and is convenient from the computational point of view. vGRF rises rapidly from zero after footfall, reaches a peak at mid-stance and then falls away to zero as the runner approaches take-off. I do not think the main conclusions I will draw will be appreciably influenced by the exact shape of the time course of vGRF, though at the price a little more computation, I could solve the equations using real data for vGRF. One crucial feature regarding vGRF is that the value of vGRF averaged over the entire gait cycle must equal the downward force of gravity (mg, where m is mass) since gravity acts constantly throughout the gait cycle. Otherwise, there would be a net vertical impulse that would either cause the runner to continue to float upwards after the completion of the gait cycle if average vGRF exceeded mg, or alternatively to be pulled to the ground if average vGRF was less than mg. One inevitable consequence is that when time on stance is short compared with the total period of the gait cycle, peak vGRF must be high (as is illustrated by the ochre dashed curve in figure 1) compared with the situation where time on stance is a large faction of the total duration of the gait cycle (as illustrated by the dashed blue line in figure 1). Once vGRF is known, the horizontal GRF (hGRF) can readily be computed assuming the total GRF acts along the line from point of support to the COG (as shown in equation 5 on the calculations page). The hGRF associated with a sinusoidal time course of vGRF is depicted by the solid ochre and blue lines in figure 1. 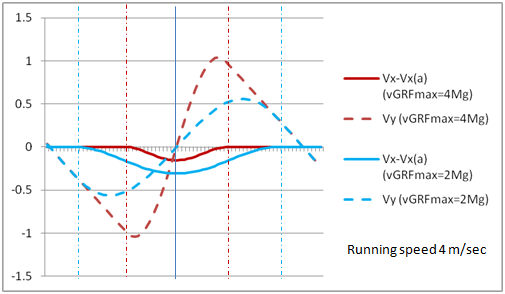 In early stance, vGRF is negative, indicating that it exerts a braking effect on the runner. Early in the stance phase magnitude of hGRF increases as vGRF increases, but because hGRF is only appreciable when the line joining point of support to COG is oblique, the magnitude of hGRF begins to decrease despite the continued rise in vGRF as the runner approaches mid-stance. By mid-stance, the COG is directly above the point of support, total GRF is vertical and hGRF is zero. After mid-stance, the line from COG to point of support is directed obliquely backwards, so hGRF is now directed forwards and has an accelerating effect on the runner that reveres the braking effect in early stance phase. One feature of interest is that when the runner spends a long time on stance, the peak magnitude of hGRF is almost the same as when the runner spends only a short time on stance, despite the much greater peak vGRF when stance is short. The reason is that when time on stance is short, the line from COG to point of support is never far from vertical so hGRF does not rise as high is it would if this line was more obliquely inclined. The fact that the magnitude of peak hGRF is similar for both short and long times on stance means that the braking effect is actually much greater when time on stance is longer, because the braking force acts for a longer time. Figure 2 depicts the time course of the velocity of the body in both vertical and horizontal direction throughout the gait cycle, based on the solution of equations 1 and 2 shown on the calculation page. Fig 2: Vertical velocity (dashed line) and change in horizontal velocity from airborne phase, V(a), due to braking and acceleration. Blue: long stance; Ochre: short stance. Running speed: 4 m/sec. 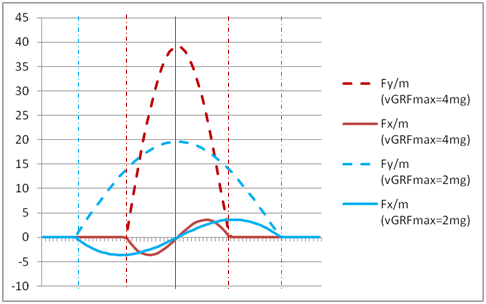 If we focus first of all on the vertical velocity in the case where time on stance is a large proportion of the total gait cycle (the dashed blue line), we see that starting from the high point at mid-flight, downwards velocity increases at a steady rate under the influence of the uniform accelerating effect of gravity. After foot-fall, as vGRF rises, the rate of acceleration slows and once vGRF exceeds mg, the downwards acceleration ceases, though the body still continues to move downwards at a decreasing rate until mid-stance, by which time vertical velocity is zero. After mid-stance, the body accelerates upwards under the influence of vGRF. Once vGRF has fallen below mg, the acceleration diminishes, though the velocity remains upwards. After the body becomes airborne, vGRF is zero and the upwards velocity continues to decrease at a constant rate as gravity retards the ascent. By the middle of the airborne period (the end of the cycle in figure 2) the vertical velocity is zero. In the case in which time on stance is short (the ochre dashed line in figure 2), the constant increase in downwards velocity during the airborne phase continues for a longer period than when time on stance is long (blue dashed line). Consequently, when stance time is short, the downwards velocity is much greater at foot-fall. As vGRF rises in the first half of the stance phase, the downwards velocity decreases reaching zero at mid-stance. After mid-stance, the high vGRF causes a greater upwards acceleration than in the case where time on stance is longer, so that upward velocity at take off is higher. The body rises to a greater height before its ascent is arrested by gravity in the middle of the airborne phase. Using equation 3 to compute distances travelled, in the case where horizontal velocity at mid-stance is 4 m/sec, it can be shown that in the case when peak vGRF is 2mg, the total vertical distance travelled between mid-stance and airborne peak is 5.8 cm whereas it is 9.8 cm when peak vGRF is 4mg. In contrast, in the case of horizontal velocity (solid lines in figure 2) the amount of slowing between footfall and mid-stance is appreciably greater when time on stance is longer, because, as we have seen, the braking force (hGRF) is of similar magnitude but acts for a longer period of time. What do these calculations tell us about mechanical efficiency? It is important to note that a substantial proportion of the kinetic energy of the falling body is absorbed and stored as elastic energy during the first half of stance, and is recovered by elastic recoil after mid-stance. The proportion that is recovered is likely to be higher when time on stance is short because tendons and muscle as viscoelastic, meaning that up to a certain point, they are more elastic when the force is applied over a shorter period of time. In similar manner, some of the kinetic energy lost due to the braking effect of hGRF in early stance can be stored as elastic energy and recovered after mid-stance. Again, the proportion recovered is likely to be higher when time on stance is shorter. However, irrespective of whether time on stance is short or long, only a proportion of the kinetic energy lost during the first half of stance can be recovered. Thus, in general efficiency will be less when the total amount of work that must be done to reverse the braking effect and to elevate the body back to its peak height is large. We have already seen that the braking effect is greater when time on stance is long, whereas the amount of upwards acceleration required to elevate the body to its peak height is greater when time on stance is shorter. Which of these effects demands more energy? The amount of work done when a force is applied can be computed using equation 6. The results are shown in table 1 for a running speed of 4 m/sec. Table 1: the work done per step after mid-stance to reverse the braking effect by hGRF and to elevate the body from mid-stance to peak height in mid-flight. Less of the required energy is derived from elastic recoil at longer time on stance (i.e lower vGRFmax). Work per Km is 750 times greater. At both short and long times on stance, the energy required to overcome braking is greater than the energy required to elevate the body from its low point at mid-stance to its high point in the airborne phase. Thus, the sum of the amounts of energy required to overcome braking and to elevate the body is substantially greater when time on stance is longer. Since the proportion of energy recovered by elastic recoil is likely to be less under these circumstances, it is clear that mechanical efficiency is less when time on stance is long. It should be noted that these calculations refer to the work done to counteract the effects of external forces acting on the body. Some additional work is also done repositioning the limbs, and at very high running speeds this can become appreciable, but is beyond the scope of this discussion. The calculations confirm that mechanical efficiency is increased by shorter time on stance. Although many coaches believe this, it is not universally accepted, so it is re-assuring to see that the equations provide a clear confirmation. In practice a shorter time on stance can be achieved though stiffening the hip, knee and ankle joints by applying greater tension in the muscles that flex and extend these joints, especially the hamstrings and quads. The BK method of running developed by Frans Bosch and Ronald Klomp focuses on decreasing time on stance via plyometric drills that develop the strength necessary to maintain adequate leg stiffness. However, the equations also provide a clear warning regarding the increased ground reaction force. As shown in figure 1, when time on stance is short, the peak vertical forces acting on the body are much larger, and the potential risk of injury is potentially greater. It is noteworthy that in the late stages of a marathon, many runners automatically increase their time on stance. This is probably due in part to the fact that as muscle strength diminishes it is harder to maintain the required tension in the hamstrings and quads, but also might be an unconscious defensive reaction to protect the body from injury at a stage where tired muscles are less able to withstand stress. So far we have not addressed the issue of cadence. For a given proportion of the gait cycle spent on stance, the magnitude of peak vGRF required to achieve a specified proportion of the gait cycle airborne is lower at high cadence because both airborne time and stance time decrease at higher cadence. In my next post I will discuss cadence. The interim conclusion is that there is a trade off between mechanical efficiency and risk of injury. Efficiency can be increased by spending a shorter period of the gait cycle on stance, but the risk of injury is greater. Therefore, a style which entails greater leg stiffness should be adopted cautiously, and requires careful conditioning of the muscles, tendons and joints to allow them to withstand the greater forces. In the discussion below, Simon drew attention to the fact that by emphasising the trade off between increased efficiency and increased risk of injury that appears to arise in the circumstances described in this post, I do not acknowledge that for a recreational runner who habitually runs at a cadence in the vicinity of 160, it is possible to increase efficiency with no appreciable increase in injury risk simply by increasing cadence from 160 to 180 steps per minute. I agree that such an increase in cadence will lead to a decrease in braking cost without the need to increase vGRF. The potential benefits of increasing cadence from 180 to 200 are less clear-cut, and are discussed in my posts of Feb 6th and Feb 27th. This entry was posted on January 16, 2012 at 9:01 pm and is filed under Running Mechanics. You can follow any responses to this entry through the RSS 2.0 feed. You can leave a response, or trackback from your own site. Interesting! A short time on stance is obviously desirable for fast running, but the trade-off is a higher risk of injury. Can we train the brain to use a short time on stance in some situations (racing for instance) and a longer time in others (long runs or recovery runs)? Can we efficiently switch between the two methods? I’m thinking of when we see Kenyans jogging they obviously have a long time on stance yet when they race it’s short. The protective tendencies of the slowing marathoner are also interesting. I’m wondering if there’s an optimal amount of shoe cushioning that allows for a short time on stance? Running in very thin-soled shoes might promote a longer time on stance as the brain tries to provide more cushioning. I think it is likely our brain does attempt to adjust tension in the muscles (thereby adjusting leg stiffness) in a way that tends to adjust time on stance according to various circumstances. I am aware that I can do this consciously when necessary. I consciously think ‘soft knees’ when running down hill. I am aware that this causes me to land with point of support behind mid-foot and almost certainly increases my time on stance. I think it is plausible that running in thin soled shoes or barefoot will encourage the brain to increase time on stance when there is a danger that stress on the limbs will become excessive. Thus I suspect that in this aspect, running barefoot or in thin soled shoes might decrease the risk of injury, but at the price of some loss of mechanical efficiency. As I noted in my post, avoiding injury is generally the highest priority, though I think that it is worthwhile to strengthen ones muscles so that they are more able to cope with the demands of high vGRF. For a young athlete, plyometric exercises are probably the most efficient way to do this. Because of my joint problems, I currently do a moderate amount of bouncing on the trampoline, though I am not sure how effective this will prove to be in improving my running efficiency. Canute, why I mention thin-soled shoes is that you often hear about marathon runners complaining that if they had ‘more shoe’ they wouldn’t have slowed at the end of their races. Also, although Bikila ran bare-foot for his first Olympic gold, he ran faster in shoes. One never sees elite marathon runners in “5-finger” shoes for instance. I’m surmising that the ideal ‘tuned’ amount of cushioning for an individual runner gives optimal minimimum time on stance and allows the runner to land with more force, and therefore have the best elastic recoil. I only had a quick skim through and did not see any mention of the energy required to recover limb positions. The graphs I have seen covering energy required to get airborne vs energy required to recover limbs show that limb recovery is the larger cost at sprint paces and obviously smaller at slow paces. I suspect limb recovery costs will increase with time on stance and so I don’t think I can support your conclusion so far. It is great to hear from you again. I hope you are well. You raise an interesting point. In my post, I did mention the cost of re-positioning the limbs relative to the COG and pointed out that at high speed this can be appreciable. In their article in the Journal of Physiology in 1977 (vol 268, p467), Cavagna and Kaneko estimate the energy required to reposition the limbs. They conclude that it exceeds the energy associated with overcoming external forces at speeds above 20 Km/hr (5.55 m/sec). However, they acknowledge that there are many uncertainties in their calculations. I agree that at high speed it is likely to be important to take account of re-positioning of the limbs, though it should be borne in mind that this energy cost will only alter my conclusion if it can be shown that the energy cost of repositioning limbs is substantially greater when time on stance is shorter. However, a comparison of my calculations with the energy costs of running determined on the basis of oxygen consumption, suggests that for running speeds up to 4m/sec, the energy required to overcome the external forces (gravity and hGRF) is the major contributor to the energy cost of running. According to the data published by McArdle in 2000, the total energy cost of running at 4 m/sec for a 65 Kg runner is 0.083 Kcal/step (=343 Nm/step). It is usually considered that this cost varies relatively little with variation in gait. While my calculation show that energy costs do vary appreciably with duration of time on stance, for the purpose of obtaining an approximate estimate of the relative proportion of total energy spent on elevating the body and compensating for braking, we only require an approximate estimate of total cost. If we take the efficiency of transduction of metabolic to mechanical energy of human muscle to be 20%, McArdle’s data indicate that the total mechanical work done is 61 Nm/step at a pace of 4 m/sec for a 65 Kg runner. If we assume that 50% of the energy lost due to falling and braking before mid-stance is recovered via elastic recoil, my calculations show that the energy cost of elevating the body and compensating for braking for a 65 Kg person running at 4 m/sec is 60 Nm/step when peak vGRF is 2 mg, and 48 nM/step when peak vGRF is 4 mg. The estimate of 50% recovery via elastic recoil is approximate, and probably over-estimates the proportion recovered at long time on stance, so the cost of elevating the body and compensating for braking derived from calculations might be a little greater than 60 Nm/step when vGRFmax is 2 mg. In conclusion, while the issue of the costs of repositioning the limbs should be borne in mind, these calculations suggest that at low and medium paces, the costs of elevating the body and compensating for braking are the major energy costs. Hence, I think it is informative to compare these costs for different stance durations. Thanks Canute – I am well, hope you are too. I will have a proper read before commenting again. I have just made a very crude estimate of the work required for limb repositioning. I measured heart rate increase while performing limb repositioning, mimicking running action with one leg and one arm while standing still on the other leg, with range of motion matching that for the swing leg and opposite arm when running with a cadence of 180 steps /min at 4 m/sec and vGRFmax= 2 mg; and with a range of motion matching that vGRFmax = 4 mg. In addtion I measured arm action alone. (The arm contributes only about 12% to the total.) I converted change in HR to metabolic cost based on estimated VO2max, and observed values of HRmin and HRmax. I converted metabolic cost to mechanical work by assuming an efficiency of 20% for the conversion of metabolic energy to mechanical work. Using this very crude procedure, I estimated that the energy cost of repositioning the limbs is 18 Nm/step when vGRFmax = 2 mg, and 13 Nm/step when vGRFmax= 4 mg. Cleary this procedure is very crude, but does indicate that the energy cost of repositioning the limbs is substantially less than the computed combined energy cost of elevating the body and compensating for braking (60 nm/step for vGRFmax=2 mg and 48 nM / step for vGRFmax=4 mg). Even more importantly, these observations confirm your speculation that the energy cost of repositioning limbs is greater when time on stance is longer. Therefore, even if the estimated values are appreciably in error, the evidence that limb repositioning cost is greater at longer time on stance, strengthens my principal conclusion that efficiency is less when time on stance is longer. Excellent article, it’s nice to see figures and diagrams illustrating the differences that the models reveal about different aspects of gait. I’ve only had one quick read through of the article, and the maths entry as well, it’s lots of words to digest 😉 As quick reply, one aspect that struck me as worthy as double checking is the computation of the energy required to overcome the lack of perfect recoil for the vertical and horizontal forces. It looks to me like you’ve computed these separately, but this isn’t how I would have done it, while I don’t maths to double check this approach doesn’t quite feel right to me. The fact that your figures suggest greater energy required for horizontal forces vs vertical forces is a bit unexpected to me. Personally I would have computed the force and energy required compress the leg from landing to mid stance by looking at the force and length changes between the COG and the ground contact point. This will required computing the change in length and the forces but since you have the path computed already, and know the vGRF and hGRF for each point along the path it will be possible to compute the energy required using a piece wise integration. As you already have the computer model doing the path, adding the required code to compute the energy required to compress the leg to mid stance and extending the leg afterwards should be relatively straight forward. If you maths is correct then energy required will match using both your separate computation approach and looking at the single computation w.r.t COG and ground contact point. Using my suggested approach won’t revel two separate quantities that we can attribute for vertical and horizontal forces, but as it’s total energy we area really concerned about in efficiency that should be an issue. Perhaps another way you could estimate the energy changes involved be just compute the kinetic and potential energy at landing and mid stance. Thinking about this stuff off the top of my head isn’t good, so I need to find some time to do some proper thinking. I thought it might be useful to yourself to double check the computations as the results and conclusions might alter somewhat. Which is close, but not quite the same as your figures, I’d guess in part because I’ve had to estimate the dv from your graph. It would be worth getting your computer code to output the figures directly. What this quick analysis of the energy absorbed on stance does confirm your findings, and dispells my hunch that something wasn’t quite right. This goes to show that ones pre-conceptions can often be wrong, you really have to do an analysis, preferable from multiple different directions to tease out the truth. The truth in this instance being that the long time on stance can result in the more energy being absorbed by the legs for the breaking effect than change in vertical elevation. What will be interesting to see is what happens when cadence is changed and also what happens when you change the speed. I am also curious about the shape of the graph of total energy absorbed by mid stance for different G loadings – for the 2G case and 4G was we see a 15% difference for my figures based on estimates above, so clearly it isn’t a linear relationship. 2G and 4G are extreme cases, so it would be useful to look at the 3G case which is nearer to what most runners are likely to be be generating. While all this theory is fun for us geeks, one does have to look to actual evidence from the real world to check whether these analysis may be reasonable approximations of real running. One analysis that springs to mind about the effect of max G loading on efficiency is seen in the analysis of Philippe Fuchs’s ultra run from Paris to Beijing – here’s Philippe adopted a lower G gait (less time in the air, but kept ground contact time similar) by the end. Measurements of Philippe’s efficiency before and after showed a drop in running efficiency. While this isn’t proof that their is a relationship between max G loading and efficiency it certainly supports the idea. The paper in question is “Running from Paris to Beijing: biomechanical and physiological consequences”. A search on the net will take you right to the paper. Canute, perhaps another interesting thing to do would be to run the computer model on the change in G loading and cadence for the figures in this paper to see if we can see the correlations with the theoretical analysis set out in your article. As you point out, the total change in kinetic energy between mid-flight and mid-stance is equal to m*[v*dv+ dv*dv/2]. For the 2g case, v=4m/s and dv= 0.308597, and the value computed using your formula is 1.282004 Nm per Kg. The value computed using my equation 6, based on numerical integration of F(t)v(t) over the relevant time interval, is 1.282002 Nm per Kg. Thus, my computations and your agree almost exactly, and confirm that the my numerical integration procedure is very precise. Overall, I am confident thet the computation of total energy cost given in my table 2 is quite precise. When I have time to do so, I will run some of the other computations you suggest, including the calculations for the case where peak vGRF/Kg is 3g. P is power, F is force, p is air density, V is wind speed, and CdA is the coefficient of drag area. A quick search of the web “Measurements of Wind Drag on People Standing in a Wind Tunnel” leads us to a figure of 0.55 for A, and Cd of 1.36, so a CdA of 0.748. So for the 4ms example used in the above article we can estimate the wind resistance force to be 7.3N, and power required is 29.3W. This force is much smaller than the maximum vGRF on stance, that’s ~1200N for me (~61kg) doing the 2G gait, or 2400N for me doing the 4G gait, so for the purposes of Canute’s analysis assuming that wind resistance is negligible looks to be a reasonable assumption. Assuming that elastic recoil is able to return 50% of the energy put in during stance we can then assume that I’d need to put in 169W for the 2G case, and 133W for the 4G case for just over coming gravity. Add in the cost of wind resistance of 29W and I’d then have have to generate external work of 198W for the 2G case, 162W for the 4G case. When I personally run at ~4m/s I’m just off my lactate threshold and hold this pace for an hour, in which time I consume around 850 Calories, which boils down to consuming just under 1000W of power. At tempo pace I’d guess that I’m probably using something like a 3G gait, so we be needing to generate at a guess from the above figures around 180W of external power, which makes me me about 18% efficient. Curious… is this anything like what other humans achieve in terms of efficiency? It sounds like a plausible overall efficiency, and suggests to me that the analysis is probably in the right ballpark. Thanks for looking at the recovery costs and apologies for missing it first time around. I’m busy at the moment so unfortunately am reading and responding quickly. I think the principle of short time on stance for enhanced efficiency is probably correct for the reasons you give. Now for the question of injury reduction. I’m not sure that a longer time on stance would be less injurous. The reason being that short time on stance tends to lead to a compact and largely vertical posture. The longer the time on stance, the more spread out the runner becomes. The key area where this is an issue for injuries is when the leg lands well ahead of the GCM. Forward landings are more likely to put force through the heel which will transfer to the knee, hips and lower back. Although the force will probably be lower overall than a shorter period on stance, the limb position will be much less favourable or ‘strong’ relying on skeletal support rather than soft tissue visco-elasticty. Furthermore, it will probably see a straighter leg which further transmits shock and potentially damages the knee socket as well as tending to other injuries such as runners knee. I agree fatigued runners tend towards longer time on stance but I think it is to be avoided where possible and is simply a fatigue response. To properly quantify the trade off for injury risk compared to stance time would require studies that have looked at the area specifically. My feeling is that longer stance time would be less beneficial for reducing injuries even though it sees lower vertical forces. But, perhaps it would just be a trade off on the type of injury you risk; short stance time may have a higher risk of lower leg injuries and longer stance time may have a higher risk of knee injuries. Either way, I don’t think there is any evidence to support the idea of a longer time on stance for injury resistance. If you have a compelling argument, I’d be interested to hear it. For this stage of the theoretical modelling I think it a bit premature to read too much into the details of different gaits that differ too far from the type modelled. Canute’s analysis is done with the assumption of vGRF curve that is a reasonable approximation of a forefoot/midfoot strike, and a heel strike would differ from this, the broad conclusions may be similar but the specifics relating to each type of strike will differ. It would be great to see the analysis tackle the a heel strike vGRF to see how the general results change, but one must first lean to walk before attempting to run with analysis so patience is needed, both in waiting for this analysis to be done and in not trying to draw too many conclusions from the initial analysis. Note how Ken’s time in the air is very short, the max G loading is even lower than 2G. I would guess he not running at 4ms a second though, and 4ms a sec I’m sure he’d be spending more time in the air, it’s still a great example though. For a heel strike I’d expect a steeper loading rate and shift of the average COG on stance towards front, but the loading rate is still heavily influenced by time on stance. The analysis that I and and Canute have done suggest halving time on stance roughly doubles the max G loading and roughly quadruples the loading rate, this relationship I’d expect to apply the heel striker and forefoot/mid-foot striker. Although the heel strike I’d expect to soften their heel strike and landing with more bent knee when running with a shorter time on stance just because of the angles involved, so they may tend a bit more towards the forefoot/mid-foot strike figures. I don’t think this ever be strong enough effect to overcome the quadrupling of the loading rate with the high G low time on stance case. I think the analysis does highlight that flaws in the idea that runners with short time on stance will land more softly and have a lower loading rate. Even as you up cadence you actually make the time on stance shorter unless you are able to just up cadence by reducing time in air, the later requires changes to your gait much more than just upping your cadence. I think piratically most people will increase their loading rate as they up their cadence. Given that it’s believed that upping cadence reduces risk of injury then I think we have to start questioning the belief that loading rate is a good indicator for injuries. Yes, I suspect postural factors will cause problematic localised loading and that will have a greater impact on injury than the absolute loading on the system. It’s definitely an area that needs some analysis though so I look forward to anything that appears. Thanks for your comments. Sorry to be slow responding. I have been away and I am about to depart again, but this time only for a two day trip to London, so I hope to catch up with the interesting issues you have raised on the coming week-end. With regard to the issue of modelling other gaits, I do intend to enter the force plate data from Cavanagh and LaFortune (for a heel striker) into the equations of motion, and compare the results with data based on Lieberman’s force plate data for fore-foot strikers. It is easy enough to integrate the equations (using numerical integration) for any real data. However the equations as currently formulated assume that the point of support remains fixed during stance. This is not true for a heel striker. It is possible to adjust the model for a moving point of support, but the equations get a bit complex, so in the first instance I will use the force plate data from Cavanagh & LaFortune without adjusting for a moving point of support. Thanks Cannute, hopefully you will get more time soon. I glanced back at the ‘Dance with the Devil’ article and comments to see what had prompted your return to this area. The main thing I would like to point out, is that the interaction of gravity and friction on the COG when the COG is forward of support causes ‘gravitational torque’ and this is not purely a rotational force – it has both linear and rotational components. A falling tree finishes with its COG further forward of support which demonstrates the linear aspect nicely. Something falling on a frictionless surface would not have horizontal COG displacement and that would be the only case where ‘gravitational torque’ were completely irrelevant with respect to linear motion. Clearly running is not like a falling tree, but the interaction of gravity and friction whilst on stance should not be dismissed unless stance is perfectly symmetrical with support having equal time and deviation both infront of and behind the COG. In that case its effect would be balanced and so not worth worrying about. I don’t know how symmetrical stance is in the paces you are considering, but I do know stance is very asymmetric for racers getting up to speed – the majority of the time is spent with support behind the COG. I suspect runners at high paces or running into the wind will also see an asymmetric gait favouring more time with the COG ahead of support whilst slower paces would probably see little noticeable asymmetry. Hi Simon, I’m afraid the whole notion of ‘gravitational torque’ providing propulsion for a runner is complete nonsense and really stems for a basic mis-understaning of the laws of physics. First thing to understand that Gravitational Torque is an established component of laws of motion governing bodies but it only significant factor on bodies of very larges scales – such as on the moon orbiting the earth where the gravitational field is stronger on the near side of the moon than it is on the far side on the moon. For objects where the gravitational field varies a very small amount across the body the effects is negligible and the principle “Gravitational Torque is zero in a uniform Gravitational Field’. Not only Gravitational Torque is negligible in context of a runner, the tiny torque experienced by us due to the difference in gravitational field between feet and head is to pull back upright rather than head down. So the ‘gravitational torque’ popularised by the likes of Pose method is complete misuse of the term. Problems with the interpretation of ‘gravitational torque’ doesn’t stop there. First up, it’s really talking about breaking the components of gravity into tangential and radial components relative to the support point, but then completely ignoring the radial components in the analysis. Ignoring the radial components is a fundamental error as it leads on to assumption that the runners velocity on toe off is forwards and downwards towards the ground, where as in reality it’s forwards and upwards. The radial velocity is what creates the upward velocity, and this has profound effect on the dynamics when doing a rotational analysis. To understand the real effect of Gravity on the runner one needs to stick in linear analysis, it’s the simplest, most intuitive and accurate way to analyse the a runners gait. With a linear analysis we know straight away that Gravity is vertical force and has no horizontal component what so ever. As there is no horizontal component it’s trivial to realize that Gravity can provide no propulsion when a runner is running on flat surface. As Gravity is vertical force it really doesn’t matter what speed you are moving at, or where you land relative to the COG, Gravity never ever provides any propulsion. If you find it difficult to get over the flawed ‘gravitonal torque’ notion just consider where the energy is coming from, if Gravity is providing net propulsion then it’s providing energy from somewhere. Where from? To convert Gravitational potential energy to kinetic energy you have to drop the height, but a runner on a flat surface has no average height loss or gain, no height change and you have no energy traded, so Gravity can’t be providing any net propulsion. Here is my definition of ‘gravitational torque’; it is a combination of forces experienced by a body when it is supported on a frictional surface and its COG is not inline with the support point. If unopposed, the resultant motion is that of a falling tree displacing the COG forwards of its initial position. It’s not a great term, but there it is – its in use already, we are stuck with it. You say that gravity is a vertical force and it cannot provide forwards propulsion on a flat surface which is true and nobody is saying anything different. It can provide no NET propulsion without a loss in the COGs elevation, absolutely agreed. Consider this though, a simple form of movement to demonstrate utilising ‘gravitational torque’ is to stand upright, fall forwards and then jump and land. ‘Gravitational torque’ provides some forwards and downwards movement (that is a combination of linear and angular movement), the jump provides counter torque reversing the angular motion and also reversing the downwards movement – but not reversing the linear forwards movement. So ‘gravitational torque’ plus a muscular action has moved the person forwards and gravity obviously remains neutral overall through that entire gait cycle. Now consider a runner rapidly accelerating. Video analysis shows that the runner spends the majority of their grounded time with support behind their COG. This means that ‘gravitational torque’ does not simply cancel itself out as it would in a symmetric slow constant speed run where the runner spends approximately equal time with the support point ahead and behind the COG.. Instead, there is the situation not disimilar from the falling jump I outlined above; the runner’s COG moves forwards and downwards before reaching midstance. After midstance the runner rises and the continued application of GRF corrects the angular motion developed before midstance and adds to the linear forwards motion. So gravity of course does no net work; the runner has to both reverse the downwards vertical motion and the forwards angular motion. But ‘gravitational torque’ is providing some angular and linear movement, the angular part being later reversed, so overall ‘gravitational torque’ has added to forward linear propulsion both in itself and as a stimulus for the runner to remain upright. Whether it happens in a sequential way like that, or more of a constant balancing act is debateable but not that important at this stage. So, ‘gravitational torque’ provides no net energy to the system but does provide a motive force that must be paid for with an equal muscular force. The action of both the ‘gravitational torque’ and the corrective muscular forces have resultant forward linear components and so do not cancel each other completely in that respect, resulting in augmented forward motion. I’m afraid this definition is mis-leading and takes one down a road of confusion about the dynamics. To understand why consider removing the ground reaction force from support point, if it there were a ‘gravitional’ torque the body would rotate and accelerate forwards regardless. However, in reality it’s not gravity that is creating the torque or any horizontal linear forces, it’s the ground reaction force that is generating the moments about the bodies Center of Mass and it’s the ground reaction (GRF) force that is generating the horizontal linear accelerations. Who generates the GRF? We do, not gravity, so as soon as you start talking about ‘gravitational torque’ right away we know that you’ve got your actions/reactions the wrong way around. The term ‘gravitational torque’ in context of a runner is pseudo science, it’s not a term put forward by those with a good grounding in mechanics and laws of physics. Personally, to stick with mis-use the term is rather foolish, it only holds the debate back in the realm of pseudo science. In the realm of proper science ‘Gravitational Torque is zero in a uniform gravitational field’. Pose Method, Chi Running and plenty of others champion the idea that ‘gravitational torque’ provides propulsion. The theories behind these techniques are pseudo science, but alas even those rational enough to realise that their theories are flawed still ended up using their flawed terminology and thinking. “Consider this though, a simple form of movement to demonstrate utilising ‘gravitational torque’ is to stand upright, fall forwards and then jump and land. Oh dear, you’ve fallen into the trap of flawed thinking that the mis-use of the term ‘gravitational torque’ seduces you in to. It’s the tilted GRF that generates the forward motion of the body, not gravity. If you were to stand on ice and lean forward there would be no horizontal component of GRF and you just fall vertically downwards. It is true that if you start standing then lift you forefoot subtle you start to lean forward, but what is actually pushing forwards is that fact that you’ve altered your GRF so that rather that going vetical down through the middle of your foot you’ve move the GRF so it’s being generated through your heel which is behind your COM and thus generates the linear component of force that pushes you forward. You might perceive it as gravity pulling your forward but in reality it’s just your body pushing you forward due to the inclined GRF, you aren’t generate any extra GRF, your just where it’s being applied through so at this point the motion feels passive. Once you’ve tipped yourself forward you body is now out of equilibrium with the GRF behind you and unless you now activity generate a strong horizontal GRF by pushing off with your legs and feet you tip all the way over and fall face first. The longer you wait before your actively push of the further your tip, and the further your tip the greater the horizontal GRF you’ll need to generate to stop the rotation forward. With a bigger horizontal GRF we also see a great forward acceleration. So if we want to accelerate hard we tip ourselves along way forward. For sprinters in starters blocks they actually start tilted and low so right at the start they can generate massive horizontal GRF’s to get themselves going, they have to generate this big forces just to balance once they hands are pulled up. Sprinters of course start with their COM low and by top speed have their COM’s at the highest point. A curious thing about being a biped is that the their is subtle interplay between balance and acceleration. We vary the vertical and horizontal components of our GRF in order to in balance ourselves both in rotation and linear accelerations. To enable us to accelerate which have to get out bodies in tilted forward position so that we can then generate the required horizontal GRF and associated accelerations without tipping ourselves head back, and when we want to stop accelerating we have to generate slightly too much horizontal GRF over several strides to rotate ourselves back upright so that the net GRF is now vertical. When we want to slow down we have to tilt backwards, but to achieve this over several strides we have to generate too much horizontal GRF forward to tip ourselves back, only once we are leant back we can apply the net rearward GRF to slow ourselves down. The above is what is really happening to use when we run, no need for any pseudo science or rewriting established scientific terms. I think the point you may have overlooked is that the useful GRF brought about by a lean, gravity and friction can be completely passive – any stiff object toppling over exhibits this behaviour. The GRF would not exist without gravity and friction. Similarly, a person leaning forwards only needs enough muscular effort to make themselves stiff (which is quite small when combined with the already relatively stiff skeletal system). So I disagree – we do not create the type of GRF that arises from ‘gravitational torque’ any more than a stone on the ground generates GRF – the GRF is a reaction to gravity. GRF has many sources in running such as simple horizontal component (linear braking when a runner lands ahead of COG for example), push off (muscular creation of GRF), etc. ‘Gravitational torque’ is a qualified GRF that does not absolutely need muscular effort and it is not simple linear braking. It only requires support out of line with the COG, gravity and non-zero friction. I see you seem to have trouble relinquishing your grip from the mis-use of the term Gravitational Torque. Please go to a technical library and pick up on books on physics and mechanics to understand what Gravitational Torque is. You won’t find any engineering or physics books that refers to ‘gravitational torque’ like you are describing, and when solving dynamics problems you’ll never find any of the texts formulating the problems in the way you are. I didn’t overlook the effect of passive forces, please go back and re-read my previous comment, go search for the world passive. Perhaps one of the problems you are having is that you considering the problem of analysis running gait form a static analysis perspective rather than a dynamic one. When doing a static analysis because there is no motion you can make assumptions about the relationships between forces such as the GRF and the force of gravity. However, as soon as you have a dynamic system there is no longer a simple relationship between the GRF’s and Gravity, even on completely passive systems this is the case. For a runner the GRF varies between zero when in the air and several times Gravity by mid stance. On average the vertical GRF will equal the force of Gravity, but the instantaneous GRF at any point on the cycle various enormously. I must go so I’ll have to cut short for now. Let me attempt to reduce this discussion to its bare bones without unwelcome terminology so that neither of us need to spend too much time with responses. Point 1: I think that a GRF with vertical and horizontal components can be created via the interaction of gravity and friction on a leaning stiff object. The creation of this GRF needs nothing more from the object than stiffness. Point 2: The above should not be dismissed in running – it is a mechanism that can add to the resultant GRF at specific points of the gait cycle. When on stance there are two points when the GRF magnitude equals gravity and that’s shortly after landing and shortly before toe off, this points in time are infinitely short and the angle to the vertical at which these points occur is non trivial to calculate. At all other times the GRF doesn’t not equal the force of Gravity, and since the only times that it does are infinitely short these points have infinitely small effect on the actual dynamics. So what controls the GRF for all other points on stance? It doesn’t correlate with gravity so what value should we assign to it? Since the only times it does correlate have an infinitely small effect the whole answer to the dynamics has to come from elsewhere. How does you handle this in analysis? I think I can safely dismiss an infinitely short effect as being negligible and unhelpful in analysis. These infinitely position of this short points in time are not even trivial to calculate. I really do think you are confusing yourself by trying to hard to use static style analysis of forces, this approach is fundamentally flawed. When you talk of “gravitational torque’ what you are actually talking about is the effect of the tangential component of gravity w.r.t ground contact point. Now it is possible to do an angular analysis of running gait w.r.t ground contact point, but the radial components of motion are totally dominant, one simply can’t assume radial velocity is zero and ignore the most dominate effects on running gait. To ignore the radial effects is to assume an upside down pendulum model for motion, but this motion doesn’t correlate in anyway to the runners motion on stance – the vertical velocities are all opposite to what happens in real life. To do a proper angular analysis is horribly complicated, and not something I’d recommend. You can see how things don’t quite add up in your approach in that in one sentence you’ll agree that Gravity can’t provide forward propulsion then shortly after you argue that that torque or GRF’s that it generates do provide propulsion. You can’t have it both ways. The best way to analyse and understand running gait is to use a linear model using the center of mass as the frame of reference. With a linear analysis we know right away that Gravity is vertical force and doesn’t provide propulsion. We also know that is net elevation doesn’t change so we the amount of Gravitational potential energy we can trade with kinetic energy is zero. As soon as you start arm waving about tangential components of gravity producing torques and horizontal GRF you have to know you’re on thin ice, it simply doesn’t add up. The linear analysis approach that Canute has used for this article is sound, it will also eventually generalize to handle wind resistance and the irregular GRF’s found in real runners gaits. In these analysis there is never any need to take into account gravity except in the vertical axis, and there is no tangential or radial components of gravity to worry about – these are completely irrelevant to a proper analysis of running gait. There really is nothing to gain for doing an angular analysis and breaking the out the tangential and radial components of Gravity. A proper angular analysis required taking into account centrifugal and Coriolis fictional forces and for all this pain what do you gain? It doesn’t even provide any constraints for what the GRF is. Not only is the maths much harder to formulate, the interaction of the fictional forces is rather counter intuitive. Sadly for those stuck with the notion of ‘gravitational torque’ don’t actually understand the real mechanics enough to know that they are ignoring the most dominant factors so never even realise that there seemingly intuitive explanation is in reality just scratching the surface and is fundamentally misguided. There is a lot I disagree with there, but I’m going to try and keep the discussion focused on the key points rather than answering the several new points you raise and creating an exponential and unmanageable exchange. I don’t think you answered point (1), you related it to a dynamic system instead which was the separate point (2). From that and the rest of your text, I assume you agree with point (1) for simple objects such as a pencil falling over on a table but do not see that mechanism as at all relevant in running. So, lets focus on point (2) – how can the mechanism outlined in point (1) relate to running. I don’t think the linear analysis is sound unless it is only considering a running gait that has equal amounts of stance before and after the vertical (midstance). In a perfectly symmetrical gait, the mechanism outlined in point (1) exactly cancels itself. It may be Canute’s aim to only consider a symmetrical gait as it is a reasonable approximation for slow to medium steady state running with no head wind. But, for a running gait where the runner is accelerating and experiencing more time with support behind the COG, the linear analysis may not consider the effect of the mechanism outlined in point (1). Now I know from what you said above, you will immediately disagree there so I need to take your point regarding the mechanism and that you think it is only valid when GRF = ‘gravity’ i.e. bodyweight. The total GRF at a runner’s contact point has several sources – the major sources after impact are muscular activity (pushing against the ground) and bodyweight. Clearly when those 2 mechanisms interact, they can both have an effect and create a GRF of more than bodyweight. If what you suggest were true, the action of slowly extending the legs whilst falling forwards would slightly increase GRF to be a little more than bodyweight and switch off the toppling acceleration. That clearly isn’t the case – adding GRF does not switch off gravity. So whilst I think there are probably only discreet points in the gait cycle where the mechanism outlined in point (1) could be happening and its interaction with other forces needs to be carefully considered, I completely disagree that they are the infinitely short periods where GRF = bodyweight. So I stand by point (2) at this stage – it cannot be dismissed without making further approximations. Please refer to my early comments about static analysis being a special case that allows for certain simplifications of analysis, which are however, not applicable to a analysis of a dynamic system. A runner *is* dynamic system, you simply can’t apply the simplifications that you apply to a static system. Even for a simple case like a failing pencil it’s a problem of dynamics and again static analysis won’t cut it. For a pencil with an anchored end you can make simplifications for the dynamics, and it’s possible to angular analysis the system about the anchored end and since the length doesn’t change you can discount the effects of Coriolis, but you still have to factor in Centrifugal fictional force. Also if the end of the pencil isn’t fully anchored there is a point when it’s momentum pulls its forward and the base starts slipping forward, at this points the dynamic analysis has to change and gets rather more complicated. You betcha, a falling pencil, falling tree is a completely inappropriate model to apply to a runner at no point in the gait cycle is there any correlation, the maths required to model it are completely different. Your lack on knowledge and experience with doing mechanics is failing you. A linear analysis is exactly how engineers/physists tackle dynamics problems such as runners gait, the maths are specifically formulated to work regardless of how much time is spent before and after COM passes over the contact point. Canute’s current analysis simplifies the problem by assuming an sinusoidal vGRF and zero wind resistance which means that the distance before and after mid-stance will be equal. The next step Canute has mentioned he plans will be to introduce GRF’s from real runners measured of force plates. When he does this he’ll need to alter the COM relative to the landing position to insure the overall horizontal GRF remains zero. The basic mathematical model won’t change though, one will just add in extra terms for wind resistance and set up the boundary conditions appropriate for the real-world data. No actually your model is wrong even when GRF=’gravity’, there is no point during a runners gait that you model is anywhere near to correct. My point about GRF=’gravity’ is really just point out how absurd your idea that GRF and Gravity can be directly correlated, the only times when they do correlate are infinitely short. Even for these infinitely short points in time you model is still wrong as it ignores the actual dynamics. Oh dear, even very the basics you seem to have lots sight of. Go have a look at any real vGRF acquired from a runner, at the 1G height draw a horizontal line throught the trace and you’ll hit the trace twice, once between landing and the mid-stance peak, and once between mid-stance and toe off. The GRF doesn’t pause along the 1G line, it just goes through and the actual rate at which is which is changing at the 1G point is around about the maximum in both cases. These points at which GRF = 1G are infinitely short. What you are arguing for is absurd, it fails on several different aspects to match any reasonable observation of the runners gait. You have to let go of the model you have in your head, it’s broken, and is only holding you back. I think we are at somewhat of an impasse and I’m not sure anything useful will come from further discussion. Here are some quick answers to your points. This is very general, I am looking for specifics of why the mechanism I outlined is not ever applicable to any part of the running gait. I don’t think any of that matters for 0* to 20* deviations from verical. If we were going to greater angles of deviation we would indeed need to consider the reduction in GRF at support. My model? I have mentioned a mechanism and said it cannot be discounted in running – I have not mentioned a complete model of running. The mechanism I mentioned has nothing at all to do with GRF = ‘gravity’. The mechanism shows that gravity gives rise to GRF (elementary) and that in a leaning system, that GRF has a horizontal component as well as vertical. Canute and I have looked at GRFs of runners a lot over the years, but I’m not going to defend anything on a personal level, this should just be a technical discussion. What you say about a runners GRF is true but completely irrelevant – you need to try and read what I wrote without jumping to conclusions about what I mean. Saying it is absurd is not the same as demonstrating it is absurd. You have demonstrated that you don’t like it in general but have not put forward a tangible specific which makes it rather hard to discuss. I’ve previously put forward a specific point in a runners gait where the mechanism would have the right conditions to be active. Here it is again anyway. Consider an accelerating runner spending the majority of time with support behind their COG. In early stance the COG passes the vertical well before midstance. As the COG passes vertical, it is descending and moving forwards of support. For this specific period, the GRF is a product of the runner’s weight and the runners pushing force. The runners weight alone is creating a GRF with a forwards and upwards component. The additional GRF from the runners push is also creating a GRF with a forwards and upwards component. The sum of the 2 is the resultant GRF. As Canute has since confirmed, it is moot, as he is not considering asymmetric gaits anyway and on that basis I agree this mechanism can be ignored. It is great to see such a lively debate. I am now back home and working my way through the many thoughtful comments. I have not digested everything, but I will start with Ewen’s comment about elite marathon runners preferring to have at least some padding between the soles of their feet and the ground to allow them to sustain a moderately large ground reaction force. I am incline to agree, though in my experience, the optimum degree of padding is somewhat less than in most modern running shoes. In an interview after winning the Olympic marathon barefooted in Rome in 1960 Abebe Bikila described how painful the experience had been. In Tokyo in 1964, he successfully defended this Olympic title in record time, wearing Onisuka Tigers. Modern days Tigers are fairly light-weight but in those days Tigers were even lighter, with about 5mm of a durable material between foot and ground. I had a pair of Tigers which were my all-time favourite shoes. I wore them in all my races from the mid-1960’2 until the early 1970’s, including all of my marathons. I was never aware of pain under the metatarsal heads. As a consequence of the congenital deformity of my toes, I have downward protruding metatarsal heads, so the fact that the Tigers provided adequate protection is quite amazing. Due to my malformed toes, I did have to splint my 3rd and 4th toes to stop the nail of the 4th toe cutting deeply into the overriding 3rd toe – but that was a problem whatever shoes I wore. With regard to Simon’s illustration of the way in which a COG of a falling tree advances linearly in the direction of fall provided there is friction with the ground, I agree with Robert that the horizontal propulsion is provided by the ground reaction force. The downward pull of gravity does not provide horizontal propulsion directly. However, the ground reaction force is a reaction to the effect of gravity, so it is probably reasonable to say that gravity facilitates linear motion. In the case of a runner, the GRF is a reaction to the pressure of the foot on the ground, which is generated in part by gravity itself and in part by elastic recoil of the leg muscles (which was derived from gravitational energy). However, as Simon implies, when running at constant speed in the absence of wind resistance, forward-directed hGRF in the second half of stance is matched by an opposite backward GRF in the first half of stance, and the net propulsion provided by hGRF is zero. This is the situation thay I have described in most of my discussions of running mechanics on my blog. However in the presence of wind resistance (or during accelerated running) the hGRF does have a net propulsive effect. Insofar as gravity contributes to the pressure of the foot on the ground that gives rise to hGRF, gravity can be said to facilitate the generation of the force that provides forward propulsion in these circumstances. However, I do not think it is correct to say that gravity exerts a direct forward propulsive effect. Maybe we are in danger of pedantic debate about use of words, but I am inclined to think it is most accurate to say that hGRF provides the propulsion, while acknowledging that hGRF is a reaction to the effects of gravity. Running is a dance with the devil. We have to work hard to lift our body against gravity, but in return gravity drives us earthwards, thereby generating a large GRF at impact which is both risky and effective. Tomorrow morning, after catching up on some sleep I will read Robert’s other comments in greater detail. To handle wind resistance an unsymetrical vGRF+hGRF I would compute the net hGRF for the whole system with the mid-stance position in the neutral position, i.e. no lean of the system. The net hGRF has to include the time on stance as well as the time in air. With this first pass analysis you’ll have a a non zero net hGRF and you’ll find the velocity lower at landing than at toe off. You’ll need to balance both of these so that there is an a net horizontal acceleration during stance that equals the deceleration during flight. If you balance the accelerations than the net hGRF should be zero as well. Alternatively you could balance the hGRF and then the required horizontal accelerations should match. To get the matching required I would introduce a lean of the system forward, this will introduce a hGRF component required to balance the system. You should be able to estimate the size of the lean required from the additional hGRF you require and the average size of the vGRF. Once you run a second pass of the analysis you’ll get a new net hGRF that will be nearer zero. To get refine the the net nGRF so it eventually goes to zero simply iterate over the analysis till the appropriate lean is found. One thing you will need to take care of handling real-world vGRF+hGRF data is how the data was obtained. I would expect most real-world data would have been acquired on a treadmill so won’t have any wind resistance. In theory the hGRF from this treadmill data will be equal to zero, but being experimental data it will have errors that are likely to result in the net hGRF’s not always being zero. The zero passing point of the hGRF will also be something to consider, with the computer model that you’ve developed so far this point will need to correspond to when the COM is right about the support point. This would probably be a good position to assume the initial lean for the computer model. It’d then be interesting to see how much change for this lean is required to balance the books. 1) Robert points out that the accuracy of my computations can be checked by computing change in kinetic energy between mid-flight and mid-stance. I agree. I have given details of the calculation in a direct response appended to Robert’s comment made on Jan 22 at 9:38 am. My estimation of the change in kinetic energy agrees with the calculation given by Robert’s formula to an accuracy of 2 parts in a million. The trivial discrepancy almost certainly reflects very small rounding errors in the numerical integration, and is of no practical importance. I am confident that the values of energy required to overcome braking and to elevating the body given in the table in my blog post are accurate. 2) While the computations make it clear that both the peak loading and the rate of increase in loading increase as time on stance decreases, it is debateable whether the greater loading and the greater rate of increase in loading creates greater risk of injury. As Simon implies, the joint angles at the time the loading occurs would be expected to influence risk of injury. Simon also suggests that the greater obliquity of the leg at foot strike when time on stance is longer might be harmful, especially if the knee is maintained in a straight position at foot-strike. My experience, (perhaps similar to that of Robert) is that I allow greater flexion of my knee when I spend a longer time on stance. I actually think ‘soft knees’ to prompt my brain to produce the required decrease in impact and associated longer time on stance, and my subjective experience is of less jarring of my body. My subjective experience is that longer time on stance produces less stress on my body. However, I agree that it is only by determining the forces and torques produced on each particular tissue of the body that we can make confident statements about risk of injury of that tissue. I nonetheless think that it is plausible that risk of some injuries, especially metatarsal stress fractures, is likely to be enhanced by greater load, while risk of muscle strain during eccentric contraction is likely to be greater when rate of loading is increased. However I accept that these statements are speculative. 3) Robert has provided an informative computation of wind resistance which suggests that the work done against wind resistance is relatively small under circumstances similar to those I have considered in my calculations. I think this provides greater confidence in the utility of my calculations in which I have ignored wind resistance. In my future computations, I will use Robert’s suggested method for computing wind resistance to indicate the magnitude of the error arising for ignoring wind resistance. I am grateful to Robert for his suggestion. 4) Does gravitational torque matter in running? The long discussion with Robert in the comment section on my calculations page led to a clear conclusion for the model in which vGRF has the sinusoidal form: as the COG moves upwards and forwards in the second half of stance, the speed of angular rotation the point of support the line from point of support to COG around the point of support actually decreases, but when one takes account of the change in moment of inertia of the body, the angular momentum in a head-forward and downwards direction actually increases by a small amount. In my view it is a little importance whether we describe this influence as gravitational torque or simply a ‘gravitational turning effect’. The more important issue is that gravity acting in concert with GRF does exert a turning effect in the second half of stance, in the direction suggested by Pose theory. However this increase in angular momentum does not in itself provide forward propulsion and in fact must be cancelled at some other stage in the gait cycle if a face down crash is to be prevented. As we discussed some time ago, the resultant GRF causes both rotational and linear acceleration – friction gives a forward component to the GRF. It is only when you resolve gravity alone that you get just angular acceleration i.e. frictionless surfaces. And of course for symmetrical gaits, this kind of mechanism can be approximated to nil as its braking before midstance will be approximately the same as propulsion after midstance. I think we are in agreement apart perhaps from some issues of terminology. With regard to the case when wind resistance is negligible, the duration from foot-fall to the point where hGRF =0 is equal to the period from this point to take-off, and the effect of ‘gravitational torque’ in the first half of stance exactly balances that in the second half of stance. Although I have not previously addressed the question of wind resistance, it is clear that wind resistance will exert a head-back-and-down rotational effect throughout stance. The runner must spend a shorter period on stance before the point where hGRF=0 relative to the period on stance after this point (as can be observed from video recordings). This ensures that integrated value of forward hGRH (ie the forward impulse) in the second part of stance exceeds the integrated value of backwards hGRF (i.e the backward braking impulse) in the first part, thereby providing the forward linear propulsion required to overcome wind resistance. Concurrently, the greater head-forward-and-down turning effect of gravity in the second part of stance relative to that in the first part of stance compensates for the rotational effect of wind resistance. Thus, when wind resistance is appreciable, ‘gravitational torque’ does have an appreciable influence on running. Now that Robert has indicated a plausible way to include wind resistance in my calculations, I will attempt to repeat my calculations with realistic assumptions regarding wind resistance at various speeds. I hope to produce a reasonable estimate of the magnitude of the effect of ‘gravitational torque’ under these circumstances. I think trying to quantify ‘gravitational torque’ effect is misguided, as it confuses the actual effect of gravity on the system with the misguided notion that tangential component of gravity is uncoupled and independent of the radial component. In terms of horizontal forces if you resolve the tangential component and the radial component of Gravity you end back up with zero horizontal component and the 1G vertical component. Simon and yourself have been wrongly ascribing the radial component of Gravity as to something that contributes to GRF, adding to the GRF we generate with our muscles on stance. To understand why it’s wrong to do this think about the point of toe off. At this instant the GRF is zero. If one believes that Gravity has radial component then we’d still feel a push even when we’d stopped pushing ourselves. How do you balance this fact with ‘gravitational torque’ model? If one actually believes in the ‘gravitational torque’ model surely the the point of maximum effect of the ‘gravitional torque’ will be when the displacement is highest – i.e. just a toe off. But since we know that GRF is zero at launch point the hGRF always has to be zero, and since gravity is vertical it can’t provide a horizontal acceleration so we are stuck, at the point of zero horizontal acceleration ‘gravitational torque’ is at it’s maximum. Does it not really strike one that ‘gravitational torque’ ideal simply does add up? To understand things properly, one has to go back first principles. What is really happening is that Gravity is always acting upon us on exactly the same way regardless of whether we are on stance or not, we are always experience a 1G downwards force. The nature of the effect is completely invariant of where we land relative to COM, completely invariant of what GRF’s we generate on stance. Gravity is *always* 1G downwards. Now if you want to keep doing an angular analysis around the ground contact point the acceleration that due to gravity will be downwards and when the COM is in front of ground reference point it will appear that Gravity is creating a rotational acceleration relative to that reference point, it will appear that ‘gravitational torque’ is creating the angular acceleration but this is a confusing of what really happening is that Gravity is pulled one downwards vertical. If you really want to stick with the angular analysis you need to account for the radial acceleration back towards the reference point so that the net effect is consistent with Gravity being a vertical force. Now this angular acceleration, relative to the ground reference point, that Gravity would appear to be introduce after mid stance actually applies at all times after mid-stance, including once we leave the ground. Yep even when we are following the parabolic flight we are still experiencing an angular acceleration relative point we launched from. This is what the maths tells us, and this is really what is happening is go out an observer runners in action. Should we describe this affect as ‘gravitational torque’?? We could but fact that it’s happing just as much mid-air as on the ground is rather weird… it might be technically correct, but is it intuitive? Is it helpful? Well it might not be helpful for those hoping that ‘gravitational torque’ might be some effect that aids propulsion, when all it turns out to be down to a vertical force acting relative to an reference frame left at an point on ground. So Canute, please do the analysis but don’t stop at toe off, leave the meter running, show how ‘gravitational torque’ affects the whole of the gait cycle. This will illustrate how the whole ideal is just a based around confusion of reference frames. It will show that it’s the angular momentum increase due to Graivty after mid-stance is really meaningless when it comes to understanding propulsion. Thanks and I agree with what you wrote above and look forward to your results. The point that has not been cleared up though is whether gravity acting in concert with GRF produces only angular acceleration as you stated at the end of your Point 4. The way I see it, friction at the support point prevents a purely rotational acceleration and creates an additional component of linear acceleration in the direction of travel – propulsion – along with some angular acceleration. The only time a pure angular acceleration would result would be if the support surface was frictionless which would of course prevent running completely. I seem to remember discussing this with you in detail a year or so ago and I thought you agreed with this basic point? If you have since changed your mind, I’d be interested to see the reasoning for it, time permitting on your part of course. Yes, as I understand it, we agree on this point, though we use slightly different terms to describe the same thing. As I described in my comment last night (actually at 1:23 am), gravity together with elastic recoil, which itself arises from capture of the energy of the fall, causes the foot to exert pressure on the ground. This pressure creates a reaction by the ground, the GRF. When the leg is inclined obliquely, this GRF has both a horizontal and vertical component, provided there is sufficient friction to anchor the foot. The horizontal component (hGRF) provides forward propulsion. Thus, as I said in my comment last night, the forward propulsion is provided by hGRF but generation of this hGRF is facilitated by gravity. As noted on numerous previous occasions, there is no need for net forward propulsion when running at constant velocity on a level surface in the absence of wind resistance, but in the presence of wind resistance, net forward propulsion is required. In this circumstance, I believe it is correct to say that gravity, acting in concert with elastic recoil, active muscle contraction and friction, facilitates the forward propulsion required to overcome wind resistance. I am being pedantic in choice of words because it nonetheless remains the case that the ultimate source of the energy that provides this propulsion is muscular contraction – contractions that enable us to capture recoil energy and then augment this recoil to drive the body forward and upward in the second part of stance. Therefore I am choosing words carefully to avoid fuelling the mis-interpretation implied by vague statements in The Pose Method of Running, Chapter 12: ‘The free falling concept’, and elsewhere in that book. In particular, there is no ‘fall’ between the ‘pose’ and the ‘pull’. In the second part of stance, the major action is actually a push, albeit a push in which elastic recoil plays a substantial part. I am fairly busy at present but hope to do some more calculations and post the results within the next week or two. There are certainly different words used in our descriptions and possibly a slightly different meaning too. On reflection, I suspect separating out the torques won’t matter in a numerical analysis that considers a compete gait cycle as there is fundamentally no net benefit from gravity on a level surface and fundamentally a zero overall rotation. All temporary gains involving gravity must be paid for somewhere my muscular action and so can probably be ignored in the horizontal plane. There are important mechanical features of the torques though, but I think they will come up more in a discussion of injury and what the runner actually does at varying parts of the gait i.e. how to run. For example, a longer stance time will have bigger angles to the vertical which will have an additive effect to those torques even though GRF is lower (which subtracts from the torques) when compared to shorter stance time. I’ll wait and see your calculations before making any further comment. I believe it is a mistake to couple Gravity and GRF in this way, doing so is hang up from static analysis of a rigid body, it doesn’t apply to a dynamic system on a flexible body. To understand why GRF and Gravity are not directly coupled I find it useful to consider the leg as a spring, at landing the spring is fully extended and as it’s unloaded length and creates zero GRF force on the ground and zero force on the COM. At this point Gravity is still acting upon the system but there is no GRF and no force on the COM except gravity pulling it downwards. At this boundary condition the dynamic analysis completely disagrees with the static analysis that would have a component of Gravity acting radial down the leg to the ground contact point. The next step in understanding the effect of forces that the leg generates and how this effects GRF and the COM look further along the time on stance. Here the leg, our spring has been compressed, and if it’s a perfect spring it’ll generate a force outwards at both ends. The amount of force that the spring generates is completely invariant to Gravity, the GRF, everything except the ratio of length it’s been shortened vs original length. Think about a real spring that’s small enough to hold between you thumb and index finger can compressed it and it pushed an equal force outwards towards the thumb and finger, and as long as you keep it the same length it doesn’t matter what way up you hold the spring it’ll always generate the same about of force outwards. Now think back to the leg spring – it’s amount of shortening governs the outward force it generates, not GRF not Gravity. Now consider the thought experiment, instantaneously remove Gravity from the system. Now the length of the leg spring is identical so the force it’s generating outwards is identical, and therefore the GRF it’s generating against the ground is identical. The only thing that’s change is the net forces on the COM, here we have the outward forces from the leg spring that is equal to magnitude of the force from the leg spring, and equal and opposite to the GRF, but no longer the vertical force from Gravity. This resultant will be different from when Gravity was being applied, and will be more upwards and this will create a different acceleration vector than would otherwise have existed. However, the forces on the leg spring for that instance is identical, as is the GRF. What can we learn from this thought experiment? GRF for the dynamic system of a runner is NOT directly related to Gravity, it’s only related to amount of force generated by the leg. The amount of force generated by the leg spring is also not directly related to Gravity, it’s only related to how much is been shortened. How much the leg spring has shorted is a function of the path that the COM takes relative to the ground contact point. The path that the COM takes is governed by all the forces acting upon the COM, one of which is Gravity. So Gravity influences the path that the COM takes, and the path governs the amount of shortening of the leg spring, and it’s the stiffness * the ratio of the shortening that gives us the amount of force generated and the GRF. However, there is absolutely no direct correlation, like you can make with a static analysis. One might claim this just words, slightly different meanings, but it isn’t it’s, while it’s seem subtle it’s a profound point that one needs to grasp when understanding dynamics. I think perhaps problems for a layman in understanding the dynamic system like running gait comes from the attempt to generalize thinking that is applicable to static analysis. Static problems are typically easier to understand intuitively, and for the layman something that one often can get a grasp of quick readily. It then seems natural to generalize the static analysis/understand to the case of dynamic system. In some cases the boundary cases of the dynamic system can even coincide directly with a static starting point – such as a runner standing waiting to run. However, static analysis don’t generalize to become applicable dynamic systems. One can see how this breaks down when looking at the landing point – the static analysis of this position would suggest that the GRF will be related to angle of the COM relative to the ground contact point and the force of Gravity. However, we know from experimental evidence that at the point of contact the GRF is actually zero. This demonstrates how the static analysis complete fails to represent what is going on. It demonstrates is completely wrong to apply static style analysis to a dynamic system – you simply can’t tackle a dynamics system from the direction of generalize a static analysis. For proper dynamic analysis one has to consider the complete laws of motion on the system, it’s typically more complicated to formulate and more difficult to get an intuitive grasp of the systems involved. For a layman it takes a leap to be able to formulate the model for dynamics and until one is really comfortable with dynamics systems let alone get a good intuitive feel for them. It usually takes a specialist breed to take this journey – engineers and physicists. From my experience, MEng in Engineering and Computer Science from Oxford, even among engineers and physicists you’ll find variations to those who will feel really comfortable with dynamics. However, once you do start to get a good feel for doing proper dynamics analysis you’ll know that the static analysis is actually just a special case of the dynamic analysis. You can simply a dynamic analysis to get to static analysis. You will also know that you can’t go the other direction. Which is really why I try and push the point about the failing of the static analysis. I can also spot the language that is associated with static analysis and how it sends off alarms bells when you see attempted to be used in the context of dynamic system. Robert, we are saying virtually identical things about the relationship between propulsion and gravity. The horizontal propulsive force is hGRF. The mechanism by which that propulsive force is generated involves interaction between gravity, friction, elastic properties of body tissues and muscle contraction. The primary source of the energy required for propulsion in the presence of wind resistance is muscle contraction. Furthermore, the equations that I have formulated are simply Newton’s equations of motion applied to compute the time course of acceleration, velocity and displacement of the COG using either measured or hypothetical forces acting on the body. This can be described as a dynamic analysis. I accept that my use of the term ‘gravitational torque’ might be misleading, which is why I often enclose it in quotation marks. However provided one remains aware of other factors that contribute to the net motion of the body (eg the effects the radial force that drives the body forward and upwards after mid-stance) I do not see any intrinsic problem in describing rotational motion about a fixed point of support while the body is on stance. However, one has to be careful in interpretation. I do not think this an issue of static versus dynamic analysis. Although I have never argued that either a falling tree or a pendulum is an adequate model of running, both of these moving objects provide informative insights. I think the most treacherous issue that arises in analysis of rotation about the point of support is the fact that the runner’s body is not rigid and it is necessary take account of changes in moment of inertia that can only be estimated crudely. With regard to efficiency of fuel consumption when running, issues such as rotation about the point of support whilst on stance do not at first sight appear to have any relevance at all. However, if we were to attempt to compute efficiency in capturing impact energy as elastic energy, it might be that the concepts such as the balance between the turning effect of gravity and the turning effect of wind resistance will prove useful in computing the forces that act on individual muscles and joints. Similarly, it might be that such concepts will be helpful in an analysis of forces acting on individual tissues for the purpose of estimating injury risk. At this stage, I do not know how useful these concepts will for such purpose but I see no reason to dismiss them. Meanwhile, I would point out that the analysis presented in the above blog posting is a dynamic analysis in which I compute linear accelerations, velocities and displacements. I am confident that the results are an accurate account of the model, and furthermore, that this model does provide a fairly realistic description of the motion of the centre of mass of a runner’s body when wind resistance is negligible. Nonetheless, I have found the comments of both yourself and Simon quite thought provoking with regard to interpreting the implications of the results of this analysis for estimating injury risk, and also with regard to inclusion of wind resistance in future calculations. I think your explanations/thoughts of how the forces breaks down needs tightening up. I sense that you are being as clear as could, perhaps trying to appease or find middle ground between the ‘gravitational torque’ concept with the proper dynamic analysis that we’ve both started down the journey of developing. To clear things up you need to do something about your original texts on ‘gravitational torque’. What you’ve written on this in past and the formulations you’ve provide are wrong. The model you’ve used is an upside-down pendulum, which is wrong for a runner, and the style of analysis is effectively an integral of a static analysis. As I’ve said above one can’t generalize a static analysis to make it model that provides a correct dynamic analysis. You conclusion about angular momentum before and after mid-stance while correct for full dynamic analysis (I’ll explain why in a second), your original text invite those who still believe in ‘gravitational torque’ to make the simple rebuttal that you analysis only applies to zero drag and zero acceleration. They are correct, this is one of the flaw in your original analysis, but since the original analysis was wrong for other reasons, and those believing in the magic of ‘gravitational torque’ are wrong as well, but don’t yet realize it, you get an untidy mess of discussion about stuff that is wrong on all accounts. To a see an example of this in action one has to look at Simon’s rebuttal early in the comments. You were wrong, and Simon was wrong, and lots of subsequent wasted words trying to untangle the mess. Might I suggest you edit, and add a clarification, to your original texts on the topic of ‘gravitational torque’ to avoid others getting confused. Back to what I think might be a good explanation for change in angular momentum due to gravity through stance, I’ll try and get there via a more specific explanation of the dynamics. I write this for the benefit of others trying to follow this discussion as much as to provide a clearer explanation for yourself Canute. First up one has to be clear in ones analysis and explanation that GRF is purely governed by the compression of the leg spring and any additional push off late in stance to prove a net hGRF and compensate for non perfect elastic recoil. The GRF is *not* directly related to Gravity, Gravity only effects the path along with the GRF and wind resistance due to the acceleration that they together provides, the path is a second integral of acceleration so there is no simple additive relationship between GRF and gravity like you have with a static analysis. The GRF is also not directly related to friction. Again GRF is down to the internal forces within the leg not the external forces upon it. Technically friction is a term of the force created by motion, and when there is no relative motion there is no friction. When two surfaces aren’t moving relative to each other, and are stuck this can be termed as Stiction. If the hGRF does exceed that amount that Stiction between the surface is capable of maintaining then the surfaces will slip and Friction will then need to be accounted for. However, for first pass analysis the amount of slippage can be safely assumed to be zero. Even when there is slippage the GRF is still unrelated to friction, the only thing that happens differently is that excess hGRF causes the foot to accelerate until the hGRF matches Friction. The foot slipping will change the geometry of the system so will effect the length between the ground contact point and the COM so this will then effect the force generated by the leg/spring which in term will alter the GRF. However, it’s the movement that happens first and only after this changes the relative paths of the COM and the foot does the GRF change. This is quite different to how one would see things with a static style analysis where you could directly related hGRF with Stiction. Now for the first pass dynamics analysis we’ll assume no slippage, so leg forces and hence GRF are only related to the stiffness of the leg/spring and the path, and top up forces actively generated by the runner. When the runner is not accelerating, not experiencing wind resistance and has a symmetrical GRF will have say there will symmetry of the paths before and after mid-stance, and during the flight between subsequent landings. This is the point we are at with the computer models. The next step on is to allow for wind resistance and to net acceleration into the dynamics model. Here we have to generate a net hGRF, either forwards or backwards depending upon the wind direction or whether the running is speeding up or slowing down. I’ll assume speeding up and running into wind for the following discussion, but the ideas will be valid for both directions. So to handle required net hGRF the runner will have generate either additional GRF late in stance via a stronger push off, or leaning the whole GRF forward by landing closer to the COM and pushing off later after the COM. Either way the GRF is now asymmetrically. Now since Gravity is a vertical force and for a level running surface it can’t be co-opted into creating a forward force so the entire net hGRF has to be generated by our muscles alone. Let’s me clear this rather wishy washy statement is wrong. Muscle contraction isn’t the primary source of energy required for propulsion, it’s the ONLY source of energy for propulsion that we can make use of when we are running on a flat surface. The reason why it’s important to be pedantic about this is that wishy washy statements leave the door open for misconceptions to slip in. Ahhh you a ‘gravitational torque’ advocate would say, yes mostly muscle contractions but also this is where gravity helps when we lean forward.. Of course this will be nonsense, as we know Gravity is vertical force, but as we’ve seen it can take a very long time for an advocate of ‘gravitational torque’ to let go of this bit of psuedo science. No finally, back to the differences in angular momentum before and after mid-stance due to Gravity that we observe in the proper dynamics analysis. In the past you’ve provide no explanation beyond that it somewhere else in the gait cycle balances this. If we are to be this beast to bed finally we can’t be unspecific, we have to explain exactly what is going on. This morning I had the realisation that following on for explanation yesterday how angular moment not only changes on stance due to Gravity, it’s actually change in flight as well. Now if view the angular momentum change from mid-stance to the next mid-stance gravity is always working to pull the COM forward/downward angular momentum relative to the ground contact point. This would at first seem to be an in-balance. However, if you look backwards to the previous point of mid-stance an integrate the effect of gravity on the COM you get an exactly balance backwards/downward angular momentum change. So over the whole gait cycle angular momentum is balance. Now while it’s nice to balance the books, one has to ask whether looking at angular momentum changes relative to the ground contact point has any relevance on anything of importance to efficiency or injury risk. Personally I can’t see how it has any relevance. It’s the way we express our GRF that determines loading rates, maximum loadings, time on stance, position of landing relative to COM etc. None of has any direct correlation to Gravity, not in it’s normal vertical direction, or whether you arbitrarily factor it into tangential and radial components. The only thing that correlates to Gravity is magnitude of the net vGRF, the peak and loading rates of the GRF are under our control though – this all down to our chose running gait. The only reason I can see for bothering to look at tangential component of Gravity relative to the ground contact point to provide angular moment so lauded by the ‘gravitational torque’ devotees. Now show this actually sums to zero over the whole gait cycle might be useful to illustrate how mistaken the ‘gravitational torque’ folks are. However, since they already have trouble with realizing that Gravity is vertical force so can’t provide propulsion when on the flat, and that after mid stance our bodies are going upwards, not falling downwards, I’m not sure that an additional and rather esoteric explanation based on a full analysis of gait cycle will change their minds. Perhaps it might. Can live in hope I guess. Hope this final essay helps a little bit. You’re right to disregard wind resistance in your model Canute, I don’t detect any difference in the way I’m trying to move whether I’ve got a 20mph tailwind behind me, a 20mph headwind in front of me or it’s just flat calm – only in the degree of difficulty. Haven’t visited the site for a while, and sadly, far too many comments on this topic at this stage for me to examine them all in detail, but I can’t understand Mr Osfield’s gripes. Given his background, he should realise that your model might (of necessity) be very heavily simplified, but it’s basically sound. To achieve forward motion you need to utilise both gravity and static friction together. It is good to hear from you again. I hope your running is going well. In the absence of wind resistance, muscle contraction is of course required for acceleration. When running at constant velocity on a level surface, muscular contraction is required for getting airborne, re-positioning of limbs, and overcoming the effect of brakng. There is no requiremment for net forward propulsion per se, though it is reasonable to describe overcoming braking as forward propulsion. I will be interested to include a realistic estimate of the effects of wind resistance. In accord with your comment, I expect that under typical circumstances it will have a minor but not completely trivial effect. My analysis does not stop at toe-off. I carry out the numerical integration throughout the entire gait cycle. My equations do not entail the resolution of gravity into radial and transverse components, though implicitly, such components do exist. In my equations, gravity is a constant downwards force acting throughout entire gait cycle. What emerges very clearly is that during the second half of stance, angular momentum in a head-forward-and-downward direction increases (despite a decrease in angular rotation speed). After toe-off, rotational speed of the line from the point that acted as point of support during the preceding stance period to the COG continues to decrease. Furthermore, if one employs the very simplistic point mass model in which all mass is located at the COG, moment of inertia continues to increase relatively faster than angular velocity decreases, so angular momentum continues to increase, under the influence of gravity (the only force acting in the airborne phase). Thus, at least according to the simplistic point mass model, it is clear that angular momentum increases after mid-stance, during both stance and airborne phases. During the ariborne phase this is due entirely to the influence of gravity. Whether or not it is reasonable to employ the term gravitational torque is I think a matter of terminology. With regards to your earlier comment about the existence of horizontal forces throughout the cycle when wind resistance is taken into account, I will of course include the effect of wind resistance throughout the cycle. I anticipate that the effect of wind during the airborne phase will be largely as you predict. Regarding force plate data – from memory, isn’t the Cavanagh/La Fortune data from a running track at ~6mm pace? From a quick skim it looks like the data is from an Indoor short running track so should have wind resistance relative to the running speed. Thanks very much for that link. The C&L data set is especially interesting because they provide separate data for rear-foot and mid-foot strikers. It will be interesting to compare these groups. I anticipate that the features of the velocity and displacement curves will be similar, apart from some small differences due to the higher initial loading rate is higher in the rear-foot strikers. When I stated that muscular contraction is the primary source of energy when running, I chose the word primary with some care. We agree that the force that provides forward propulsion (during accelerated running and/or in the presence of wind resistance) is hGRF. I accept your account of GRF as a reaction by the ground against the elastic recoil of a compressed spring (perhaps augmented by a minor contribution from active muscle contraction – the leg is not a purely passive spring). However the process by which the spring is compressed entails the conversion of gravitational potential energy to kinetic energy which is then converted to elastic energy, so in that sense gravity plays a role. I agree that it is misleading to say that friction contributes. As you say, provided stiction is adequate friction does not come into play, though I think it is not unreasonable to say that stiction plays a role – ensuring adequate stiction is why sprinters wear spikes. Because factors such as gravity, the elastic properties of the leg and stiction play a role in the generation of hGRF I do not think that the statement that muscular contraction is the primary source of energy is wishy-washy, but I accept that it is important to be clear that the gravitational potential energy that contributes to compressing the spring was itself created by elevation of the body due to recoil augmented by active muscular contraction during the preceding stance phase. At present I have a list of several topics on which I hope to discuss on my blog in the near future. A re-appraisal of the controversial topic of rotational motion is on this list though it will probably be several weeks before I get to that topic. I am grateful for your comments and will take them into account when I present my understanding of the topic. Thanks for this link to the paper by Chang and colleagues. I have not yet digested it fully, but my first reaction is that, contrary to the surprise expressed by the authors themselves regarding their finding that not only vGRF but also hGRF increases with increased gravity, this is exactly what would be predicted from equation 5 in the set of equations describing my computational model (reported on my calculations page). Equation 5 is based on the assumption that the runner automatically adjusts tension in the leg muscles so that for a given degree of obliquity of the leg, the resultant total GRF is directed along the line from point of support to the COG. In mathematical terms, the equation states that hGRF is equal to vGRF multiplied by the ratio of x (horizontal) displacement to y (vertical) displacement. Thus for a given pair of values of x and y displacement, hGRF will increase in proportion to vGRF . Although the authors were initially surprised by their empirical finding, they eventually reach a similar conclusion to the logic underlying equation 5. Thus their findings appear to be a pleasing confirmation of equation 5. They also observe that inertial mass has relatively little influence on GRF. Thus is largely what I would have expected. Gravity will be the main determinant of vGRF since the fall under the influence of gravity is the immediate source of the energy that produces the elastic deformation of the legs that is the major contributor to the downward pressure of the foot on the ground, and hGRF is proportional to vGRF. Therefore if gravity is held constant while inertial mass increases, the braking force (hGRF) will be expected to remain nearly constant. Because the body has more inertia, the rate of slowing during braking will be less. In other words, the effect of increasing inertial mass should be a reduction in the rate of slowing during braking rather than an increase in the braking force. The authors report a lack of substantial increase in hGRF as inertial mass increases at constant gravitational mass, but in my quick skim of the paper I did not see any mention by the authors of whether or not they observed a lesser deceleration during braking as at higher inertial mass. I would nonetheless predict that would be the case. I also note that they refer to a paper by McMahon that found that ‘Groucho running’ (i.e with exaggerated flexion of the knees) was much less efficient than running with less flexed knees. As ‘soft knees’ results in longer time on stance, this appears to be a confirmation of one of the main conclusions of my analysis – namely that efficiency decreases with increased time on stance – so I will be interested to read McMahon’s paper to see of Groucho running is indeed associated with longer time on stance. Overall, this paper by Chang appears very consistent with the model I have presented, but I should read it more carefully before jumping to definitive conclusions. Yes, those were the points that caught my eye too and as you say it appears to be some ‘real world’ confirmation. That is approximately right. As time on stance increases the main increase in energy cost arises from the greater amount of braking, which makes it necessary to accelerate more to compensate for the braking. However because airborne time decreases slightly as time on stance increases, the amount the body falls after mid-flight is slightly less, so there is a small decrease in the work that must be done to elevate the body. Yes, the average vGRF/Kg must be equal to g. Hence peak vGRF will be greater when time in stance is shorter. Isn’t it reasonable to assume that the vertical work is done more efficiently with long stance time than with short (same frequency)? Compare standing still with jumping up and down. No, shorter time on stance (for fixed cadence demands greater peak vGRF (to ensure that the average upward force over the gait cycle is g. The greater peak vGRF imparts the stronger upwards acceleration that is required to keep the body airborne for a longer time. However we as discussed above, the major change in energy cost as time on stance changes is the change in energy required to reverse the braking effect. Let me rephrase. By comparing efficiency only in terms of the theoretical energy cost, you seem to assume that the body can produce the work with equal efficiency regardless of whether it is by a low force during a long time or by a high force during a short time. Yes, my calculations are estimates of the mechanical work done. They do not include an estimate of the efficiency of conversion of metabolic energy into mechanical work. The two issues that must be considered are the efficiency of muscular contraction and the efficiency of recovery of elastic energy. With regard to efficiency of muscle contraction, efficiency is greatest at intermediate contraction rates. It decreases at low rate and also at high contraction rate. However, due to the complexity of the action of the large muscles (quads and hamstrings) which cross both the hip and knee joint, it is difficult to estimate the contraction speed of these muscles during the gait cycle. In fact I suspect that the contraction of these muscles is almost isometric during the stance phase, and therefore that the speed of shortening does not change very much as time on stance changes at constant cadence. The peak tension achieved in the muscle will be shorter at short time on stance. With regard to recovery of elastic energy, because tendon is viscoelastic, elasticity increases as rate of loading increases, at least up to a very high loading rate. I suspect that efficiency of recovery of elastic energy increases with decreasing time on stance when cadence is in the range 180-200 steps/sec. I do not have direct evidence that confirms these speculations. Nonetheless, I think the increase in efficiency in recovery of elastic energy will be much greater in magnitude than the change in efficiency due to changing rate of shortening of the muscle. So I am fairly confident that metabolic energy cost will decrease as time on stance decreases. I would be grateful for any direct evidence regarding either the rate of shortening of the quads and hamstrings during stance or of the effect of decreasing stance time on the viscoelastic properties of tendon. Thanks. I cannot shed any light on the metabolic cost, but it seems to me that it may well be higher with a higher peak force. Regarding elasticity, I suspect it may be more complex than in other viscoelastic materials. Regarding cadence, you mentioned that “As cadence increases, there will come a point at which the contraction becomes less efficient, and in addition, it might also be expected that recovery of energy via elastic recoil will also diminish. Hence there will be an upper limit to the optimum cadence.” Doesn’t this also translate to the duration of stance given a fixed cadence? I.e. there is a limit to optimal stance time, which could potentially be a sigificant factor with the short time available at optimal cadence. I suspect that these factors also vary depending on training and the distance of running. The issue is not simply a matter of whether or not metabolic cost is higher with higher peak force, but whether metabolic cost per unit of work done is higher. The calculations demonstrate that the mechanical work is lower when peak force is higher – because the saving arising from less wasteful braking far outweighs the increase in cost of getting airborne. As I stated above this is not easy to estimate the likely efficiency of conversion of metabolic energy to mechanical work, but even if there is a decrease in metabolic to mechanical efficiency at shorter time on stance, as you seem to be suggesting, it is very unlikely that such a change could off-set the gain due to reduced braking when time on stance is shorter, within the range considered in my calculations. Nonetheless, there will certainly be a limit to the maximum force that can be sustained efficiently. This limit is dependent on the both strength and power of the muscles. I agree that it is probable that efficiency of metabolic to mechanical conversion will increase with increased training. For middle and long distance runners, the proportion of aerobic type 2 fibres is probably the important factor in determining the peak force that can be sustained efficiently. ‘Long hill’ sessions are one of the most effective ways for a runner to increase type 2 aerobic fibre capacity. Therefore, I think that it is desirable to include hills in your training program, and to run with a fairly short time on stance. As cadence increases (and stride length decreases) the peak force required for a given time on stance decreases simply because airborne time decreases and the average vertical force/Kg over the gait cycle must remain equal to g. Nonetheless, there is little doubt that there is a limit to how short time on stance can be – imposed both by risk of injury and also probably be a decrease in efficiency of recovery of elastic energy at very shot times on stance. Sprinters usually spend substantially less time on stance than distance runners. Sprinters also usually do more resistance training to strengthen their muscles, but nonetheless, I suspect that many distance runners spend longer on stance than is the optimum for efficiency, even after allowing for their less powerful leg muscles compared with sprinters. However it also important to bear in mind that avoidance of injury is even more import than the minor saving in efficiency that might be achieved by adjusting running style. So I would not recommend simply decreasing one’s time on stance without conditioning the muscles to withstand the greater load. First of all, I think your analysis of the mechanical efficiency is very interesting. However, I don’t see why you are so convinced that the metabolic to mechanical efficiency cannot outweigh the mechanical efficiency. You are suggesting that there is a limit where this happens. What suggests that this limit is hard to reach? I have experimented in altering my gait to minimize vertical oscillation. As long as I can do it without introducing tension, it feels more efficient (but this feeling may be deceptive of course). With a high cadence there is not so much room for braking anyway. It seems to me that the shorter time on stance in faster running is a consequence of the range of motion, and in sprinting the cadence adds to that. It need not be a sign of efficiency. I agree that sprinters are not necessarily efficient . For a sprinter, power is probably more important than efficient fuel consumption (similar to the comparison of an F1 racing car with a touring car). I mentioned sprinting to illustrate the fact that muscles can contract fast enough to achieve times on stance shorter than is usual in distance running. I was interested to note when I attended a Pose clinic run by Dr Romanov a few years ago that he stated that the ideal time on stance was 2 video frames (66 ms) although he considered that a time as long as 4 frames (132 millisec) was acceptable. On this issue I agree with Dr Romanov. However I have been somewhat surprised to encounter Pose coaches who deny that Pose presents a risk of metatarsal stress fracture. According to your table 1, the cost of elevation with short stance time is similar to the cost of overcoming braking with long stance time. Smaller but similar. However, the force required for elevation doubles while the force required to overcome braking does not increase at all. To me as a lay person it seems plausible that the metabolic cost of increasing the force grows much more than linearly. We are talking about an amount of force that can only be sustained for a very short time. Elasticity might counteract some of that, but all of it? When running with what I perceive as minimal oscillation I have no perception of braking as long as I have a high cadence. The stance phase only feels softer, presumably because the force is much lower. I know it is a widely held belief that braking should be minimized. But I suspect most people are not aware of the inherent trade-off with vertical force, at least not its magnitude. Your analysis is the first I have seen to attempt to prove the efficiency. But it still misses the metabolic aspect. Look for example at the above video of Ken Bob, where he has very little air time. Does it look inefficient? According to your analysis, it would be much more efficient for him to have a bouncier gait with shorter stance time. I’m sure he could achieve that by more tension. I believe this discussion is far more relevant in slow running, where there is more room for choice of stance time. I notice now that you mention on the page “dance with the devil” that longer stance time is desirable at slow speed. How do you arrive at this conclusion? Does speed change the trade-off in your force analysis? It would be interesting to see how. As you correctly state, my calculations only determine the mechanical work associated with braking and getting airborne. At present, we can only speculate about possible changes in the metabolic to mechanical conversion efficiency, and the efficiency of recovery of elastic energy, in various different circumstances. In general I would expect that the variation in efficiency of recovery of elastic energy will vary more with variation in time on stance than metabolic to mechanical energy conversion efficiency, but I cannot prove this. Perhaps the most relevant evidence I am aware of is the observation that the amount of metabolic work done by the large muscles of the leg during stance is surprisingly small. This suggests to me that recovery of elastic energy is a more important factor during the stance phase. Regarding your statement about the force required to overcome braking (vGRF) remaining constant while the force required to get airborne (hGRF) increases as stance time decreases, it should be noted that both vGRF and hGRF arise from the muscle and tendon activity that produces a force acting along the direction from COG to point of support. When time on stance is short, this force is greater. However because peak hGRF occurs when the leg is more near the vertical position at short time on stance, the peak value of the component that acts horizontally is not greater. If metabolic to mechanical conversion efficiency does change in an appreciable manner as force increases, the proportional change in metabolic cost will be the same for vGRF and hGRF because these are two components of the same force – the force acting along the line from COG to point of support. With regard to recovery of elastic energy, the nature of the viscoelastic properties of tendon indicates that elastic recovery will improve with shorter time on stance in the range we are considering, but I do not think there is any convincing way we can settle this issue at present. One thing that I do plan to do in the near future is to determine the time on stance (for a givedn speed and cadence) at which the rate of increase in mechanical work required to become airborne as stance time decreases is equal to the rate of decrease in braking cost as stance become shorter. At times shorter than this value, the increase in mechanical cost of getting airborne will outweigh the reduction in braking cost. This will only address the question of mechanical costs, but at least this will be a start in estimating the most efficient time on stance. I will also look further into the question of the elastic properties of tendon. My understanding is that elasticity increases with applied force up to a certain value and then remains fairly constant, but I do not currently have access to data concerning the range over which it is constant for the tendons in the human leg. As for the question of variation in metabolic to mechanical conversion, I hope I will be able to obtain relevant data about metabolic work done by the large muscles during stance, so that I can either confirm or refute my hypothesis that variation in metabolic to mechanical conversion efficiency is unlikely to play a major role in the variation of efficiency with variation of time on stance. I hope I can assemble this information in the next few weeks. With regard to the video of Bob, he looks very relaxed but that is not the same as being efficient. I suspect that he is in fact quite inefficient. Almost certainly his braking cost will be relatively high. However, it is likely that he is feeling very comfortable because he is not experiencing large vGRF. Furthermore, because he is likely to be running at a pace far below anaerobic threshold, he will not feel breathless. Efficiency is not the only important goal in recreational running – in fact I think efficiency matters very little during recreational running. I will re-read my ‘Dance with the Devil’ article (which I wrote a long time ago) to establish the context in which I recommended a long time on stance when running slowly. In general it will depend on the purpose of the run. If it is a recovery run, minimising the potentially damaging effect of eccentric contraction is much more important that fuel efficiency. Bob’s style looks perfect for a recovery run. On the other hand when racing distances from 5000m (when it is best to be either a little above the anaerobic threshold) to the marathon (when it is best to be a little below anaerobic threshold), efficiency of oxygen consumption is of great importance. This is when efficiency matters most. Efficiency is also important in an ultrmarathon, but in fact avoiding damage due to eccentric contraction is even more important, so I would recommed a relatively long time on stance durng an ultra-marathon. Thanks for your response. I would very much appreciate further clarification on how force varies metabolic to mechanical conversion efficiency. This question of optimal stance time is in my opinion the biggest open issue in running technique. Regarding ultra-running, you have a good point that damage to the muscles is an issue even when it does not result in injury. For sub-elite runners I would say it is an issue even at marathon distance. We can certainly see that top elite long distance runners have a short time on stance. However, they are taught to apply as much force as they can to the ground, believing that this generates speed. So they might very well get a habit of applying more force than what is optimal. Since training is much more important than mechanical efficiency, I don’t think we can assume that the top elite have optimal technique. In top elite sprinters there is hardly any vertical oscillation of the torso. The long air time is consumed by the range of motion of the legs. I suspect that is how we are designed to run at slower speeds as well: smaller range of motion, correspondingly longer stance time, and relatively stable torso. I agree that the question of optimal time on stance is a crucial question, and value you comments on this question. I will do what I can to throw some more light on this issue in the next few weeks. Does running speed affect the horizontal braking impulse? In table 1 you have used a speed of 4m/s. Would it come out differently with a speed of, say 2.5? The work required to overcome braking decreases at slower speeds. As reported in my post, at 4 m/sec, cadence 180 steps/min and peak vGRF/Kg=2g, the work to overcome braking is 1.285 Nm per step,. As there are 705 steps per Km at 4 m/sec, this cost per Km is 961.5 per Km. At 2.5 m/sec, with cadence 180 and peak vGRF/Kg =2g, the cost is 0.501 Nm per step. At this speed there are 1200 steps per Km, and the cost per Km is 600.9 Nm per Km. The reason for the lower braking cost at lower speed is that hGRF = vGRF.x/y where x is the horizontal displacement of the COG from its location at for mid-stance and y is the vertical displacement. At each corresponding time point during the stance phase the horizontal displacement is less at slower speed compared with higher speed. The value of vGRF is the same at corresponding time points when we are considering the case where peak vGRF is the same at the two speeds, so the value of hGRF will be less at lower speed. The work done in each small time interval is hGRF.velocity. Therefore, there will be a reduction in cost per step due to the lower value of both hGRF and velocity. However the saving due to lower velocity only applies to the cost per step. Because the number of steps will be proportionally greater at slower velocity, it is only the lower value of hGRF that provides a saving in cost per Km. I’ve been following this exchange with interest and agree with Klas that we need to consider metabolic efficiency if possible. We also need to be careful with considerations of elasticity – the only figures I have seen referenced were in relation to Pistorius (the runner with carbon fibre lower legs) – his elastic return was something like 60% whereas the best elites got a return of around 50% and hence he was not allowed to compete against elites. I think a working figure of 40% would be the best case for recreational runners with optimal time on stance. You have mentioned a couple of times that shorter stance time is achieved by ‘increasing tension in the leg muscles’. I don’t agree completely with that mechanically and it is potentially a terrible idea to focus on when running. To illustrate why I don’t agree completely mechanically, it would probably be helpful if I show my understanding of mechanical efficiency. I consider the most mechanically efficient system to be the wheel. Under ideal conditions, it has zero vertical oscillation and zero braking. If we take that as the starting point and consider now running. For running we are limited to discreet points of contact with the ground and non-zero time to arrange another contact so we cannot emulate the wheel. The closest we can get is with extremely quick changes of ground contact which involves an additional cost to rearrange our limbs. So to me it seems that mechanical efficiency at a particular pace is a trade off between the cost of repositioning limbs and the mechanical costs to overcome braking and getting airborne. Whilst assumptions can possibly be made about these costs being low at low running speeds, I think they need to be included forn an overall picture. Why I don’t agree completely from a mechanical perspective with the notion of ‘increasing tension in the leg muscles’ to achieve short stance time is because the repositioning of limbs is also a key factor and indeed one we have more control over. As stated in my reply to Klas, I believe we need more information before we can draw any firm conclusion about changes in metabolic to mechanical conversion efficiency as time on stance changes. With regard to repositioning costs, in our discussion a few weeks ago you suggested that repositioning costs would increase with increasing time on stance, and my very crude estimate based on measurement of increase in heart rate associated with mimicking the actions of repositioning supported you assumption. If we were right in our tentative conclusion on this issue, taking repositioning costs into account would serve to reinforce my conclusion that efficiency increases with decreasing time on stance (at least within the range dealt with in my calculations). With regard to my use of the phrase ‘increased tension in the leg muscles’ I think that there is no doubt that the tension in the leg muscles must increase to achieve a shorter time on stance at fixed cadence. The muscles must provide tension to oppose the buckling at the joints as GRF rises. GRF rises to a greater level when time on stance is shorter, since mean GRF/Kg averaged over the gait cycle must be equal to g.
The question of the best mental image to invoke in order to achieve the appropriate tension is a different issue. To a large extent it is best to let non-conscious brain mechanisms make this adjustment. My own experience suggests that if I have reason to want to exert any conscious control over this it is most effective to think ‘ soft knees’ when I wish to reduce the tension, as for example when running down hill or during a recovery run when I wish to minimise stress on my legs. When I want to achieve the opposite effect, I simply concentrate on getting my feet off the ground as quickly as possible. I don’t think that is the whole story for limb repositioning – I think the cost of limb repositioning is governed mainly by pace and stance time (which both increase limb displacement) and air time (which gives time to reposition). So a short time on stance alone does not necessarily give rise to low repositioning costs – a ‘bounding’ runner is an example of this, the long air time providing plenty of time to reposition limbs. Also, short time on stance with very short air time (very high cadence running) will increase repositioning costs compared to short time on stance with a moderate air time. My point being, it is all inter-related and needs to be carefully considered to ascertain to the most efficient mechanical gait. ‘Increased tension in the leg muscles’ is one way of achieving a short stance, yet it is the only part you have mentioned on a couple of occasions which is why I am pointing it out now. As above, the way the limbs are recovered can mean that there is not an increase in vGRF so no need for ‘increased tension in the leg muscles’. To illustrate, consider the extremely high cadence example; short ground and short air time so does not result in increased vGRF at all whilst on stance. You seem to be considering a fixed cadence and simply changing vGRF to have shorter stance time. I think we can leave aside mental queues for the best way to run as it is a can of worms and will lead us way off topic. I only brought it up as I think it is important to clearly separate what is mechanically efficiency from what we can change in our running. I agree that we can decrease time on stance without increasing vGRF simply by increasing cadence. I discussed the effect of increasing cadence in my subsequent post on 6th February. However the point of the analysis in the post that we are discussing here was to establish the mechanical costs of changing time in stance at fixed cadence. As described in the conclusion to my post on 6th February , the net mechanical costs due to braking and getting airborne can be minimised by having short time on stance and high cadence. However, I also noted that due to effects such as variation in efficiency of elastic recoil, there will be an upper limit to cadence (and a corresponding lower limit to time on stance) . Although I am less inclined to place emphasis on the possible variation in the costs of metabolic to mechanical conversion than on variation in energy recovery via elastic recoil, I accept that with our current knowledge we cannot answer this definitively. I hope to return to that issue in the near future, when I have assembled a little more information. As for repositioning costs, I agree that they are appreciable, and therefore, should be taken into consideration. I consider that our initial discussion of this topic a few weeks ago was far from conclusive, and will also make a further attempt to clarify this issue. Canute, thanks for your response on how speed affects the cost of overcoming braking, from 1,285 to 0,501 at 2.5m/s. It looks to me that table 1 would then show a higher total work for short stance time at that speed. The challenge of limb repositioning plays a role, but I wonder if efficiency is the right way to think about it. After all, limb repositioning works during stance as well. However, at high speed the leading foot is high up in the air at terminal stance, and we need air time to get it down. You are correct in your assumption that at very slow speeds, the combined mechanical costs of braking and elevating the body will be minimised at a longer time on stance than is the case at higher speeds. Although the energy cost of braking is always greater at longer time on stance whatever the speed, braking costs are smaller proportion of the combined cost at very low speeds. Therefore at very low speeds, the saving in braking cost achieved by decreasing time on stance will no longer exceed the increased cost of elevating the body . When cadence is 180 steps/min and peak vGRF/Kg = 4g (corresponding to time on stance= 131 ms) the energy cost of braking is 0.244 Nm per step. When peak vGRF/Kg = 2g (time on stance= 262 ms) the energy cost of braking is 0.500 Nm per step. When peak vGRF = 4g, the energy cost of elevating the body is 0.953 Nm per step while at peak vGRF = 2 g the cost of elevating the body is 0.573 Nm per step. Thus, the combined cost of braking and elevating the body is 1.197 Nm at peak vGRF=4g and 1.073 Nm at peak vGRF=2g. At a speed as slow as 2.5 m/sec, the combined costs will minimised at a peak vGRF somewhat less than 2g. Thanks! Then I guess the mechanically optimal air time is very short at that speed. This is the bulk training pace for a lot of recreational runners, and even race pace in long ultra-running. If your calculations are correct, they show that braking is not something to worry about at that speed, with a high cadence, not even from a mechanical efficiency point of view. I think that is important. As the context of this thread is the above article, I’ll follow on with my comments against your next article instead for easier reference to all the issues at hand. I do however think this article is a little misleading in that the interim conclusion does not really follow the title of the article ‘The equations of motion of the runner: is there a trade-off between mechanical efficiency and risk of injury when running?’. I don’t believe you are intending to be misleading, but thought it worth pointing out. The title of the article should really be something along the lines of exploring how vGRF changes at a constant cadence. Without cadence, the question of mechanical efficiency vs injury risk is not properly addressed for running in general. vGRF does not have to increase with a shorter time on stance so it cannot be concluded that short time on stance is potentially more injurous for running in general. I am fairly confident that there is an upper limit to cadence, simply because there comes a point beyond which it will be less efficient recovery of elastic energy. Furthermore, although we still need more information about metabolic to mechanical conversion efficiency, as cadence increases there will come a point where the efficiency of metabolic to mechanical energy conversion decreases. I think it is likely that in muscles such as soleus, gastrocnemius, and vastus medialis, increases in cadence will produce greater increases in speed of muscle fibre shortening during the concentric phase of contraction than are associated with increases in peak vGRF (which I believe is achieved mainly by approximately isometric contraction of extensors and flexors). My current opinion is that at cadences below 200 steps per minute, the speed of contraction is still in the range where efficiency increases as stance time becomes shorter, but if cadence increases indefinitely, the efficiency of metabolic to mechanical conversion will eventually decrease. So at least for the time being, I am inclined to think that the evidence indicates that at speeds of 4 m/sec (or faster), the goal should be to run with a cadence near to 200 steps per minute, and a fairly short time on stance. Thus, I consider that the title of my post is valid and not misleading. However I accept that I need to present the results of computations over range of speeds and cadence values to establish the circumstances in which the net costs of braking and elevating the body are reduced by decreasing time on stance. In the near future I plan to present a more comprehensive set of computations. Even this will not address all of the relevant issues (eg repositioning costs) but I believe that it is a good start to compute the costs of braking and elevation of the body because these are large fraction of the total at moderate speeds. Furthermore, I consider that the available evidence suggests that in the range of cadence, time on stance and speed which I am considering here, repositioning costs will be less for shorter time on stance. However, that is yet another issue to re-consider in the future. While it is difficult to take all of the possible issues that might affect efficiency into account in a completely convincing manner, I think can assemble a reasonably coherent argument supporting my conclusion that efficiency increases as time on stance decreases, in the circumstances under consideration here. Furthermore, I think that there is a convincing argumment regarding the upper limit of what can be gained from increasing cadence. Sometime within the within the next few days I will do a new posting that explains why I am fairly confident about my main conclusion. I hope that will allow us to move the discussion onwards. The only issue I have is the layout of this article when considered on its own – the conclusion does not answer the title adequately. Recreational runners often have 160spm or less and can make easy gains in both efficiency and injury resistance by increasing to 180spm (or at least not increase risk of injury). When increasing beyond 180spm, limb repositioning costs would certainly need to be considered to find out when an increase in cadence has more energy cost than benefit. The conclusion of this article without some text on cadence ignores your later article and makes this article a little misleading on its own. You know there is more to decreasing stance time than just increasing vGRF, so why omit cadence by fixing it? The final paragraph of the post was intended to deal with the issue you raise, In partcular, I pointed out that unitl cadence had been considered, the conclusions of this post were only interim conclusions.. I will consdier adding a brief addendum to make things clearer. Simon has an important point. It will always be better to reduce stance time by increasing cadence than by increasing air time. I should clarify my post from earlier today. What I tried to point out is that the time required for limb repositioning in the air is not a trade-off vs stance time. I agree with Canute that cadence seems limited by elasticity. At higher speed, the greater range of motion indirectly results in the foot hitting the ground with higher speed and with more force from the descending body. This will recruit more elasticity and therefore enable a shorter stance time without sacrificing efficiency. As I pointed out in my post on 6th Feb, I consider that it is best to increase cadence to quite high values – in the vicinity of 200 steps per minute. However I do not believe it is correct to state that it is always best to reduce time on stance by increasing cadence. As you yourself point out, maximum cadence is limited by elasticity. I have presented a more detailed discussion of the limits on cadence in my response to Simon, above. What I meant was that we can increase cadence until we have reduced stance time to the limit of elasticity. As far as I could find out of your discussion on the limit of cadence above, you agreed that the other factor limiting cadence was repositioning cost, and you also agreed that repositioning cost increases with stance time. If we increase cadence, stance time is reduced. So it is not clear to me how the cost of repositioning would in practice limit cadence. You also agreed that repositioning cost is only an issue at high speed. My main interest is recreational running. In practice I find runners have more difficulty achieving high cadence at slow speed. My feeling is that the limit then is the time it takes for muscles to react and contract efficiently during stance. 200+ cadence at slow speed would require running on the toes. At high speed, it is easy to exceed 200. I suspect that elite distance runners would benefit from increasing cadence. And the way to do that is to push off less. I should perhaps clarify that by recreational running I mean as opposed to elite running. I’m not talking about recovery runs. I should probably use a different term. The reason why increasing cadence increases repositioning costs despite decreasing time on stance is that an increase of cadence at constant vGRF shortens the swing time in addition to shortening time on stance. The shorter swing time creates the need for a higher rate of acceleration of the fpt to enable it to overtake the torso in mid-swing and this higher rate of acceleration costs energy, so repositioning costs increase. In contrast, when time on stance is decreased by increasing vGRF at constant cadence, swing time increases, acceleration of the foot is less and repositioning costs decrease. Because repositioning costs increases as square of the running speed, the repositioning cost becomes a large proportion of total cost severe at high speed. Thus, at high speed increasing cadence does not produce an appreciable gain in mechanical efficiency, whereas increasing vGRF does produce a gain in mechanical efficiency. Thanks. But the shorter swing time comes with a shorter stride lenght as well. I could not find a more detailed discussion of this trade-off. I just noticed you had a discussion with Simon about it a couple of days ago on the other page about cadence, but far from conclusive. Too busy now, but I hope to read more carefully and get back with a question on that page instead next week. The limit of cadence is very important too in my opinion. Meanwhile I would like to add some thoughts. I have never perceived repositioning as a limitation of cadence. My perception is that stance time is the limitation, i.e. the ability to land and bounce up efficiently, in sprinting as well as in jogging. Even if there is a theoretical limit by repositioning, it might be subsumed by the limitation of stance. It might be worth considering the case of running in place, where repositioning does not require acceleration. We have pretty much the same limitation of cadence in that case as in jogging speed. Since cadence increases with speed, and very much so in sprinting, it seems counterintuitive that repositioning should be the limitating factor if that cost increases with the square of speed, and we have reason to believe that stance time and peak force is the limiting factor in sprinting. The greatest contribution to repositioning costs is the work required to accelerate the leg during the first half of the swing phase. The energy required is depending on the acceleration required multiplied by the velocity. Because the leg must accelerate from rest to overtake the torso by mid-swing, the major factors determining the acceleration of the foot are the running speed and the duration of swing – the shorter the swing time the more rapid the acceleration must be. Time of stance plays an important part insofar as longer time on stance is associated with shorter swing time. However only a small amount of the repositioning cost is incurred during stance. I provide an outline discussion of these issues in my post on 27th Feb, and will be happy to discuss this further. I agree that a consideration of running on the spot is interesting. I have been wondering why it requires a strong conscious mental effort to develop a high cadence when running on the spot or when running slowly. I think it might be because we are able to generate adequate elastic recoil under these circumstances. As for sprinting, I think the reason that stance time and peak force are the limiting factors in sprinting is because we reach the limit of cadence (around 205 steps per minute) at 3 K pace. Increasing pace beyond 3K pace requires further reduction in braking, which is achieved by increasing vGRF and shortening the time on stance. The foot is certainly a crucial part of the braking effect in the first half of stance, when the COG is behind the foot. However in the second half of stance , even though the foot is stationary on the ground, the hGRF generated by the foot pushing against the ground is the force that pushes the body forwards, thereby overcoming the braking that occurred in the first half of stance. A body can only accelerate if an external force is applied (Newton’s first law of motion), and the only horizontal forces that act during running are hGRF and wind resistance. Because the foot is behind the COG at the end of stance it must move forwards relative to the COG so that it is ahead of the COG at foot fall (except in a strong headwind). In the case of Ken Bob, the fact that swing time is short means he has to accelerate the lower leg and foot relatively rapidly,compared to a runner with a shorter time on stance at the same speed and cadence. However compared to a person running at 5 m/sec, his repositioning costs are small because repositioning costs increase in proportion to the square of the running speed. (This not only emerges fro the application of Newton’s laws, but was demonstrated experimentally by Cavagna and Kaneko in their paper in Journal of Physiology).. I don’t see what prompted you to explain propulsion. I don’t think our views on that differ. Propulsion applies to the whole body including the foot. The foot will get the same speed as the body after take-off without repositioning. As you know, the foot that will be the next support is already ahead of the body at take off. If you look at the video of Ken Bob, I think you will see that the trailing foot does not need to move forwards at all relative to COG during swing (air phase). The repositioning action is only relative to the body and can be done solely during stance (except some to reduce braking at higher speed). I agree that air resistance plays a role in repositioning, and that depends on running speed, during stance as well. But I still don’t see how this limits cadence, as long as higher cadence reduces range of motion. I will read your cadence page carefully later and see if I can understand. I cannot resist speculating a bit more :-). It seems intuitively plausible to me that limb repositioning imposes the limit on cadence as we approach top speed, where sprinters reach 300 or so. It would be interesting to have data on how top cadence correlates with top speed for sprinters. Would you agree that at long distance running speeds, cadence is more limited by the ability to bounce efficently in stance? I discussed propulsion because I am not sure whether or not we mean some different when we use the word re-positioning. I wanted to make it clear what I understand to be the role of the foot in the second half of stance. It is involved in propulsion at this time. The main repositioning comes later. It is good that we agree about the nature of propulsion. With regard to your speculation about what limits the cadence in distance running, I think that even at cadence around 200 steps/min, at speeds of 5 m/sec or faster, that increasing cadence gives very little increase in efficiency. However whether this actually limits cadence or not, I do not know. As I speculated in my post of 27th Feb, cadence might be limited by the ability to exert enough force to increase the tension in the muscles to achieve efficient elastic recoil. If that is what you mean by ‘bounce’ then I think we might be saying something very similar using different words. Canute, if in swing you include the period when the other foot is in stance, then it makes more sense to me. I thought you were referring to the airborne time. Perhaps you can also better understand my comments in the light of that misinterpretation. I still suspect we disagree on the limits of increasing cadence, but I think it’s better to continue that discussion on your recent page about that topic. I will get comment there when I get the time. Reading up on your other recent writings about cadence, I get confused by the terminology. In your new blog post Feb 27 you wrote “at fixed cadence, swing time decreases as time on stance increases”. But here you wrote Feb 29 that swing “includes the airborne phase and also the stance phase of the other leg”. That sounds inconsistent to me. I don’t mean to be picky, but it makes a big difference. The duration of two steps is equal to time on stance plus swing of one leg. Therefore at fixed cadence swing time decreases as time on stance increases. Swing is also the sum of one stance plus two airborne phases. At fixed cadence, as stance time increase, airborne duration decreases by the an equal amount and the sum of two airborne phases decreases by twice as much, thereby producing a decrease in swing time. While my statement that swing phase includes airborne phase and stance phase of the other leg, is correct, it might have caused less confusion if I had said swing phase consists of two airborne phases and stance of the other leg. Then I understand the definition of the swing phase, thanks. You were talking about a full gait cycle of two strides, whereas I was talking about one stride, beginning with one foot landing and ending with the other foot landing. Regarding my latest post, there is no need to assume the reduction in stance time does not sacrifice efficiency. But the faster more forceful landing will likely cause a more forceful contraction that results in a shorter time on stance. I also believe that stance time is reduced by the forward momentum of the torso at higher speed, essentially pulling the leg from the ground. I agree that a greater impact generates a more forceful push-off. In part that is the effect of elastic recoil, though it is also probable that a higher impact stimulates a stronger active concentric contraction by the leg muscles. However, I do not think it is correct to say that the torso pulls the body off the ground. Getting airborne requires a push, not a pull. The value of vGRF/Kg averaged over the gait cycle must equal g (as you yourself pointed out a few days ago). For a given cadence, shorter time on stance must be associated with greater average value of vGRF during stance. vGRF provide a push. You are of course right that the runner must push enough. But do you agree that the forward momentum at high speed limits the time available to push off? I agree insofar as at high speed, the distance travelled during a given stance time is greater, and would lead to greater extension of the hip in late stance, thereby promoting a shorter time on stance. To achieve this (at a fixed cadence) vGRF will have to increase. Great. This is one reason why I believe range of motion at higher speed requires longer air time. Another reason is that greater hip extension of the stance leg requires greater hip flexion of the swing leg at terminal stance, so the foot is higher up in the air and we need time to get it down. I suspect that the range of motion alone explains the increase of air time that we see in higher speed running.